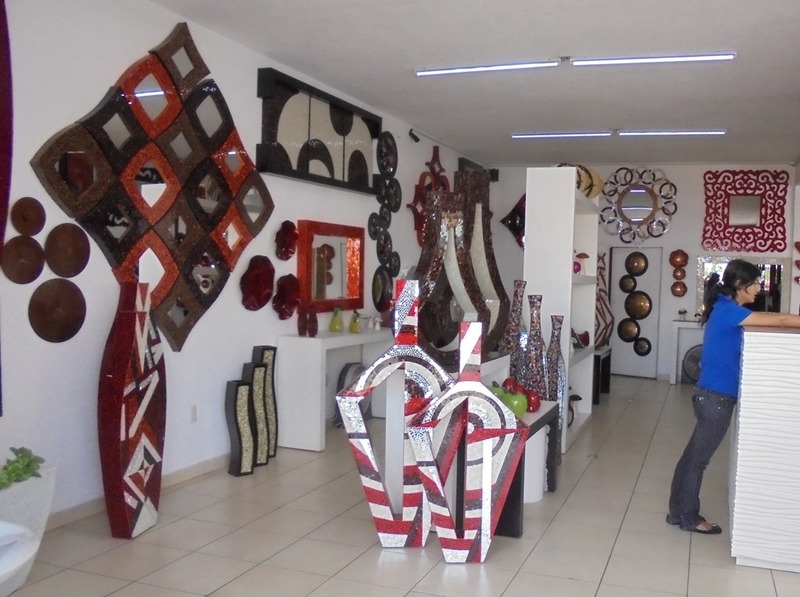 We had heard of the crafts manufacturing area of Guadalajara, Tonala. 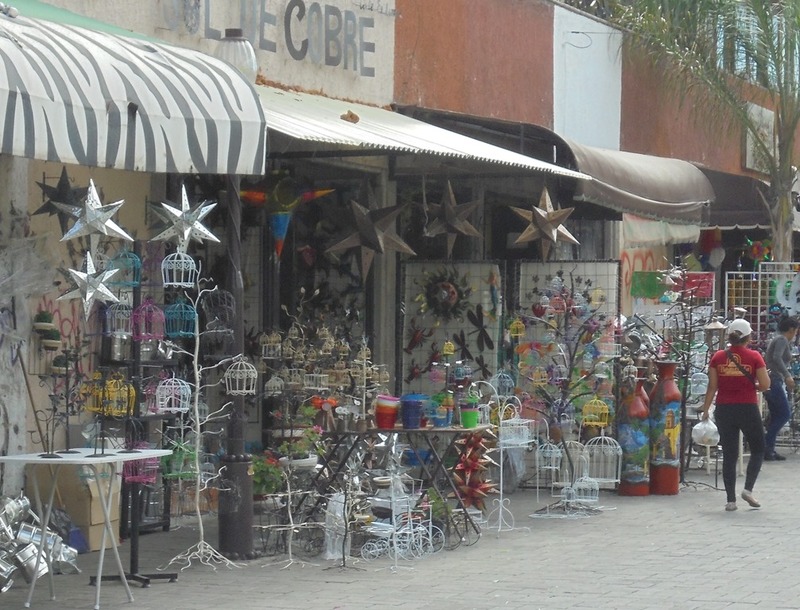 It was once a village nearby to Guadalajara. 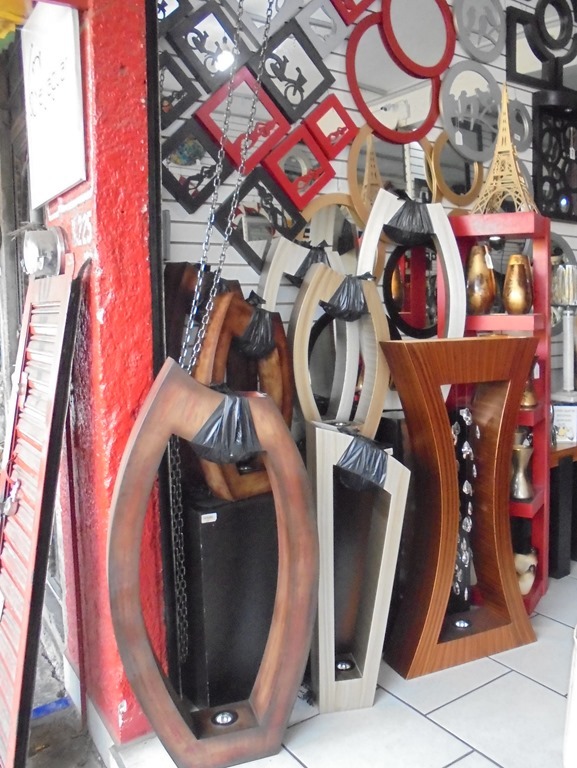 As a crafts area it houses hundreds of factories and thousands of shops. 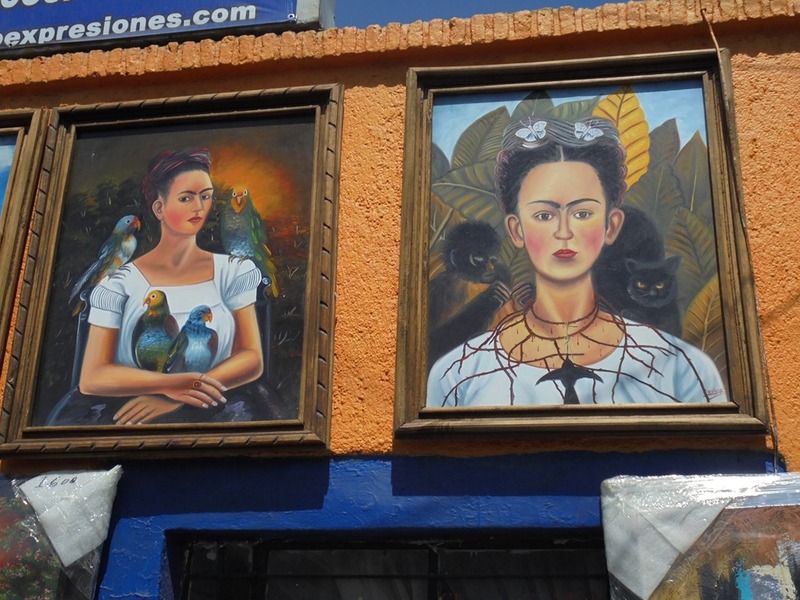 Much has been written about Tonala, like this post from TripAdvisor, so I will not try to explain the background of this area, rather I will continue to write about our first impressions. Living in our new (partially) furnished home, there are a few things for the house that we are looking for, mainly some rugs that will enhance several spaces in the house, and a few select pieces of furniture. 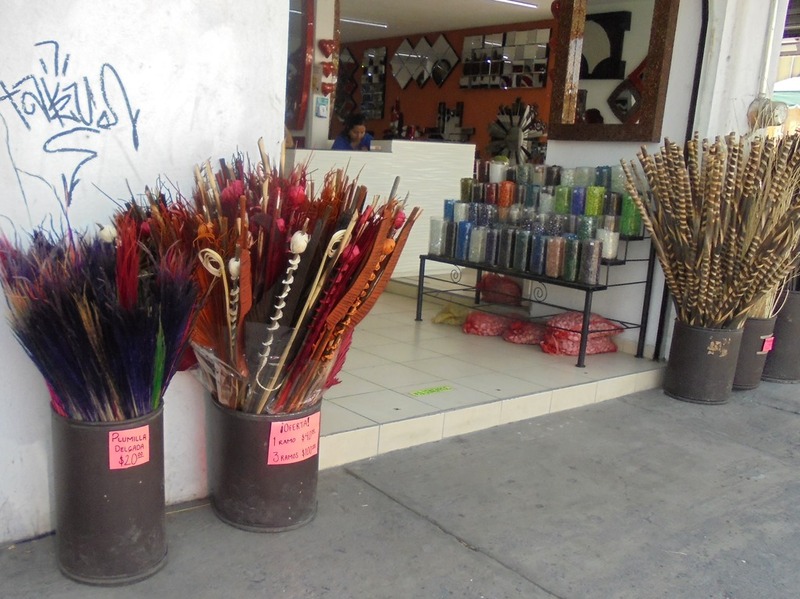 We don’t know about rugs, but furniture seems to be made and sold in Tonala. We really want rugs, so we can clarify the colors we will use in the house. So we started this trip with many hopes and desires (which is always carries with a potential for disappointment and suffering). 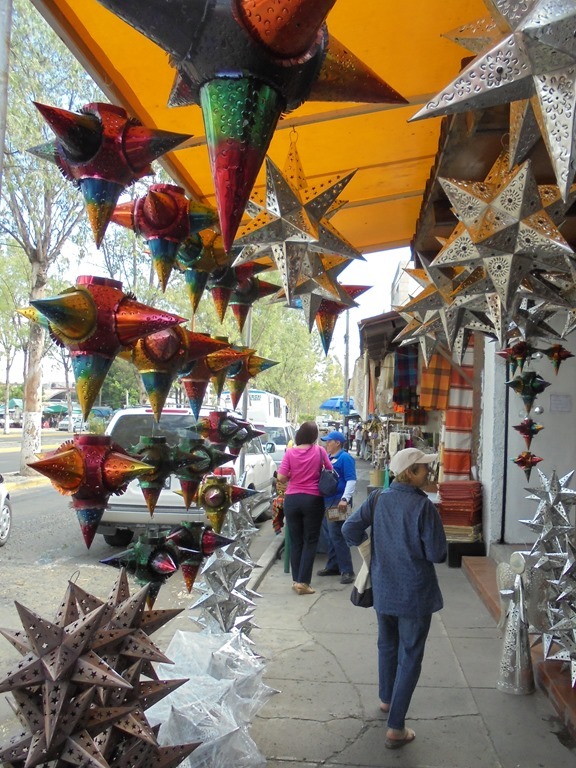 So far we don’t know much about Guadalajara. 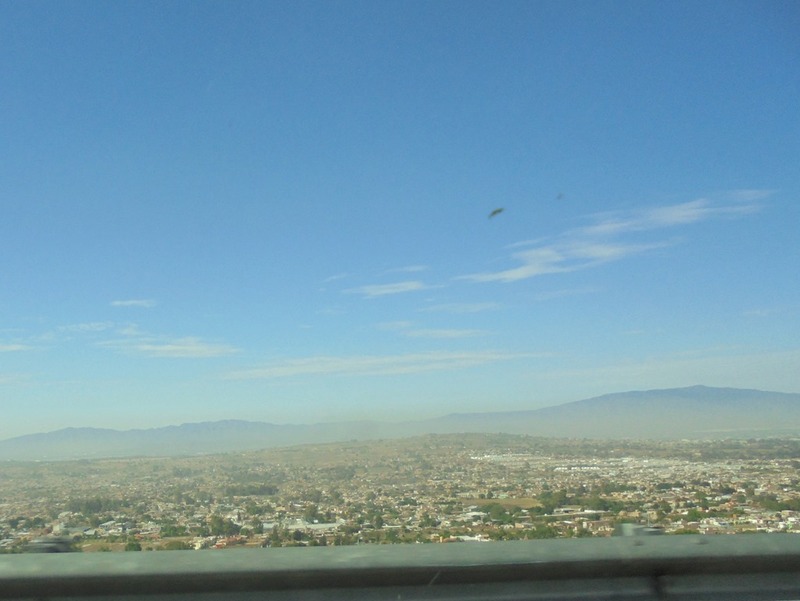 The photo below shows that it is built in gentle hills and valleys. 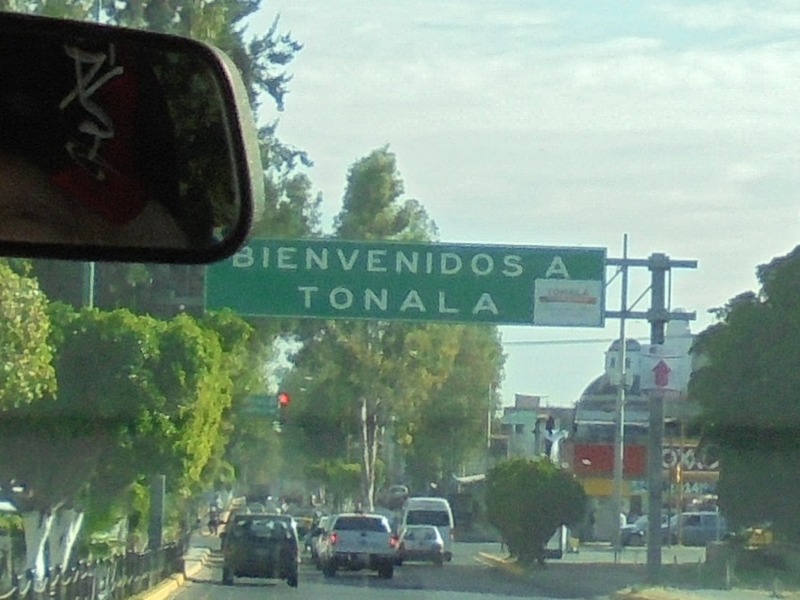 The sign welcomes us as we near the Tonala area. At a stoplight there is an acrobat performing. 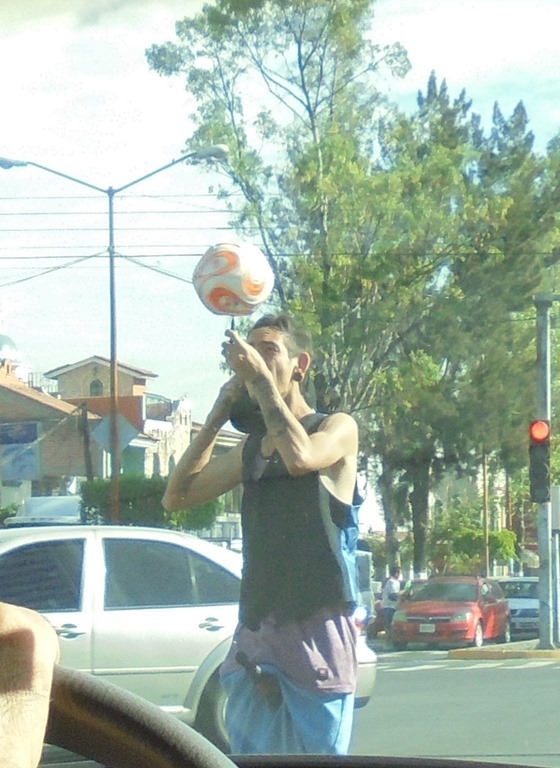 This is already a pretty usual sight for me in Guadalajara, having seen this several times. We stopped for a bite to eat. 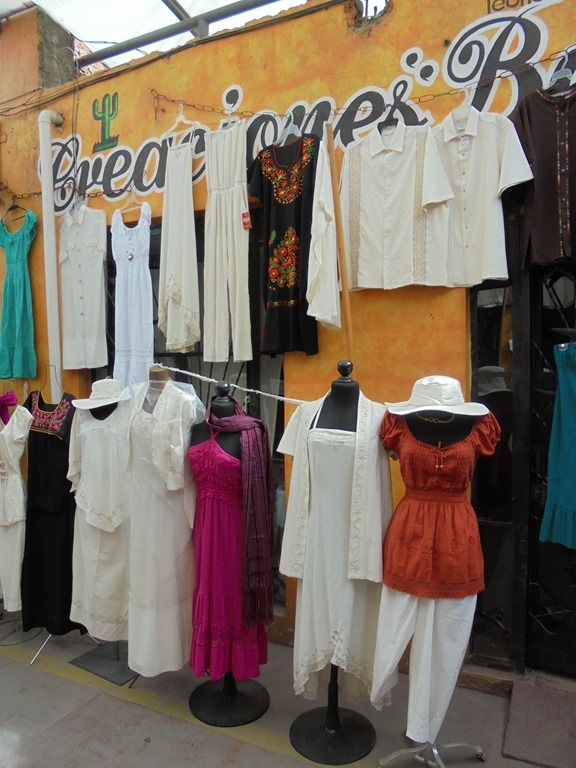 A shop by the restaurant was putting out their display of women’s clothes for the day. 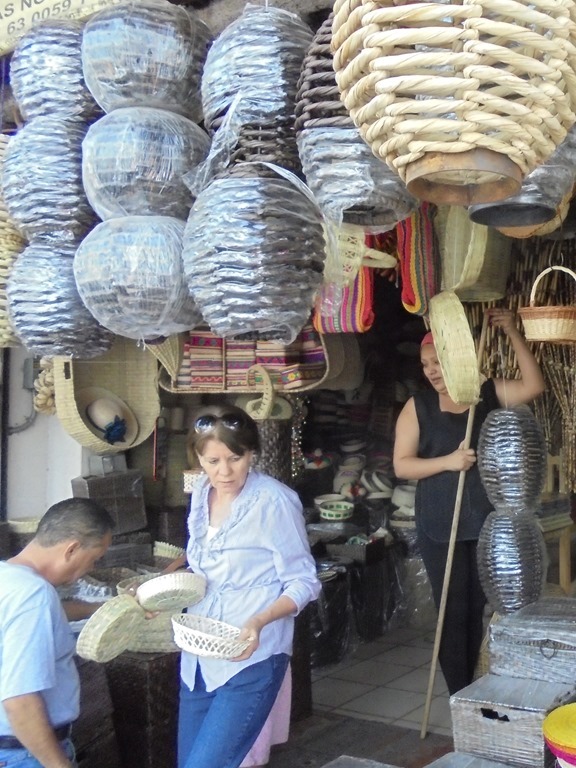 It is about 10 in the morning and many shops are being readied. This place gets s slow start in the morning. 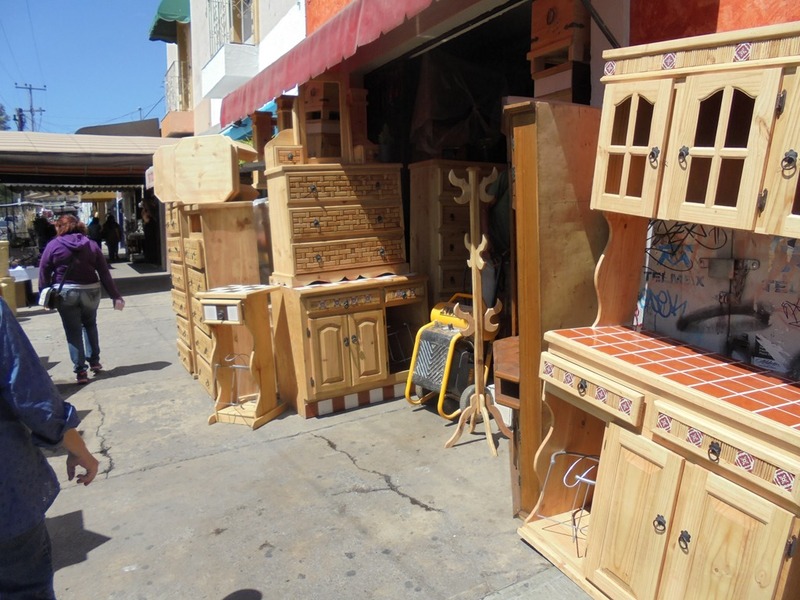 Wooden furniture is one of the products offere3d and made in Tonala. We hope to find one of the several pieces we want today. We didn’t see it here. 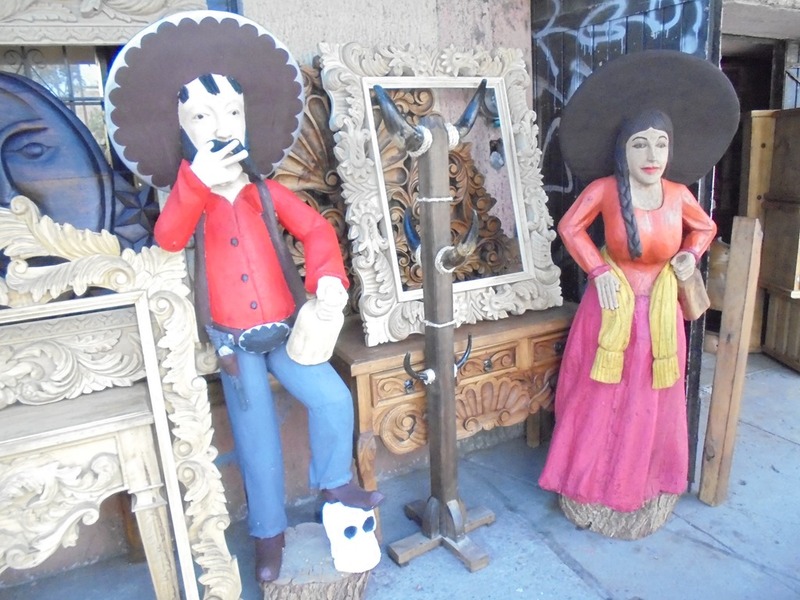 There are many many items to decorate your house, including this life-sized Mexican man and woman. There is a stretch of wall. Naturally it has been painted by local graffiti artists. Here is a demon. There are vendors set up selling goodies to shoppers. 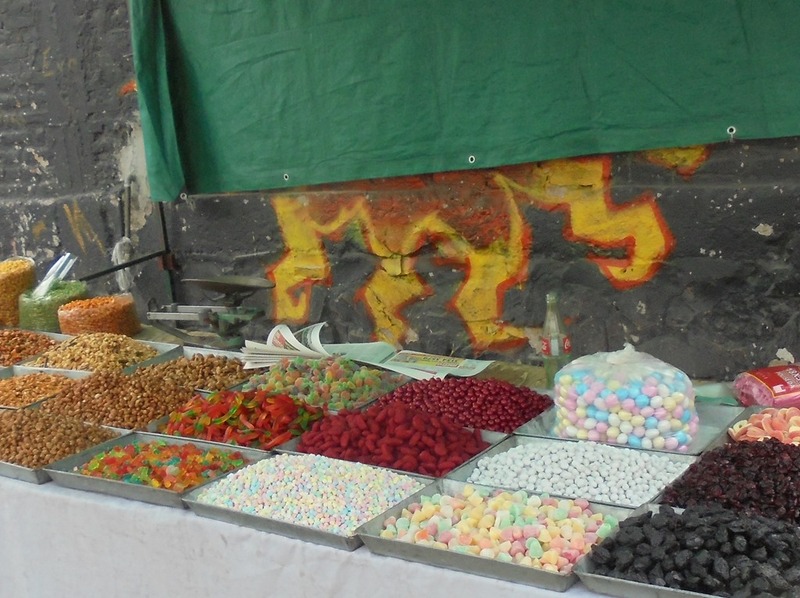 This one is mainly candy. Not for us. 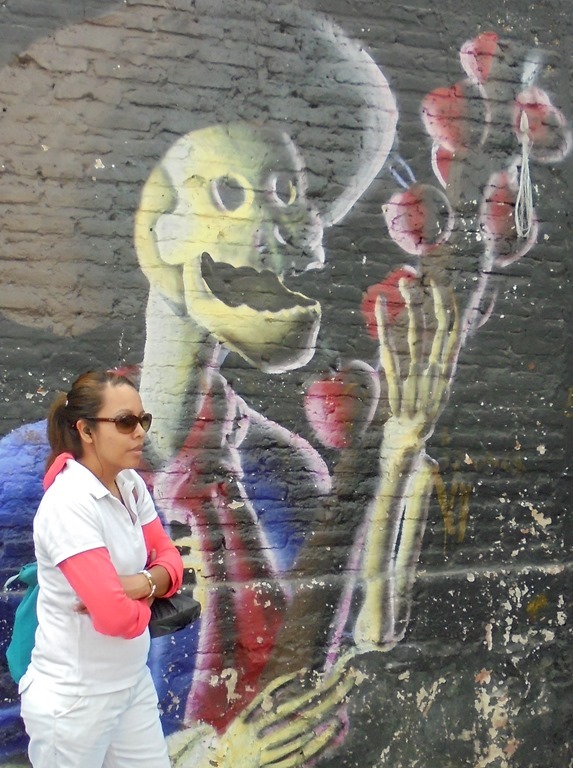 Here is a skeleton enjoying, I think, apples. 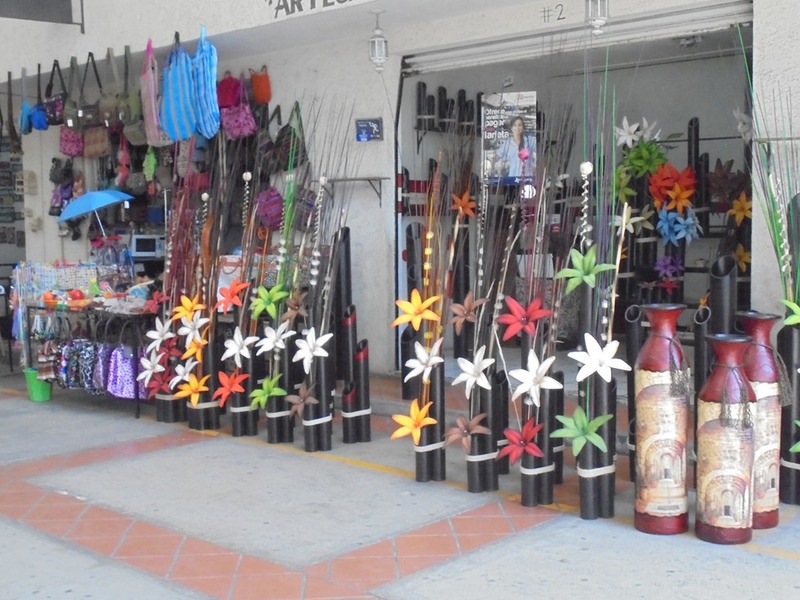 We are on the main shopping street in Tonal. Booths line most side street, too. Most shops are narrow and long, with their goods receding into the distance. There are so many things. 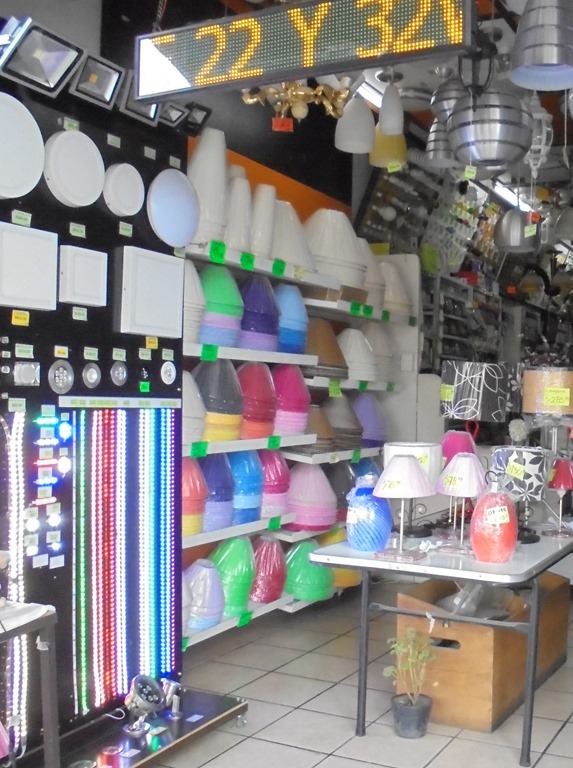 This shop features table lamps. 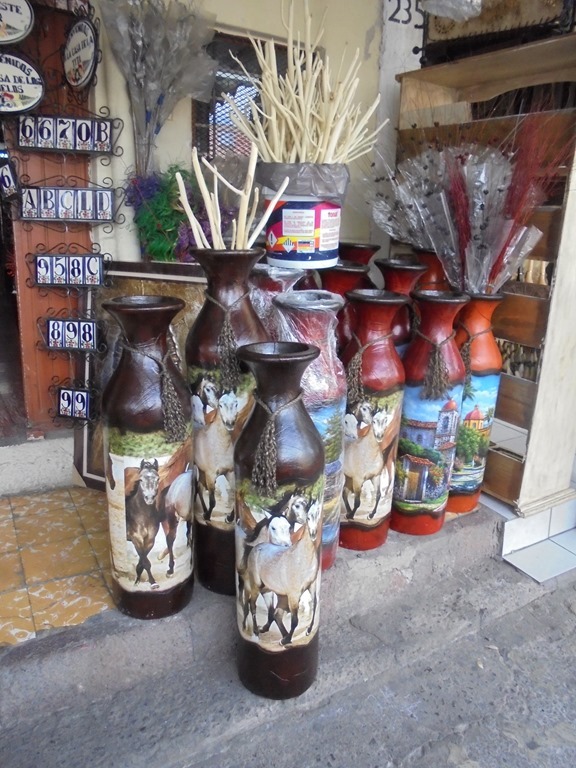 Carafes and drinking glass sets are offered here. 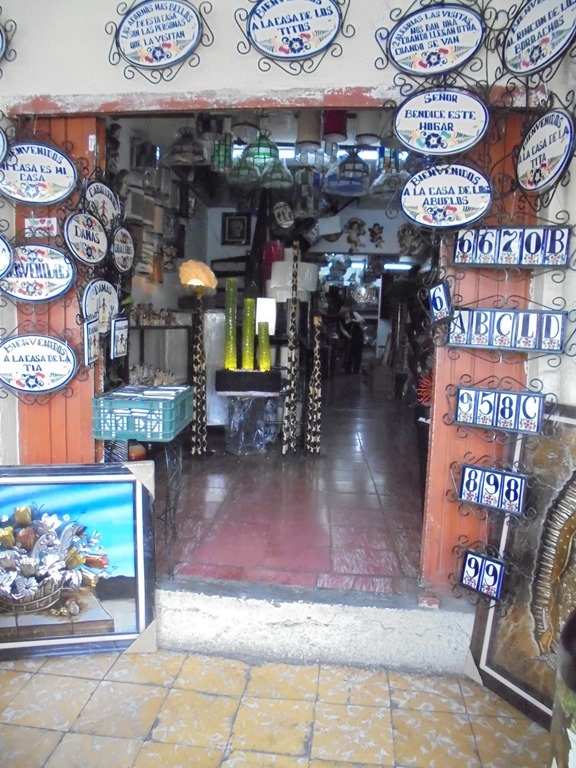 Enamelware is featured in this shop, especially signs that look like road signs, displayed at the shop’s entrance. Big pots. 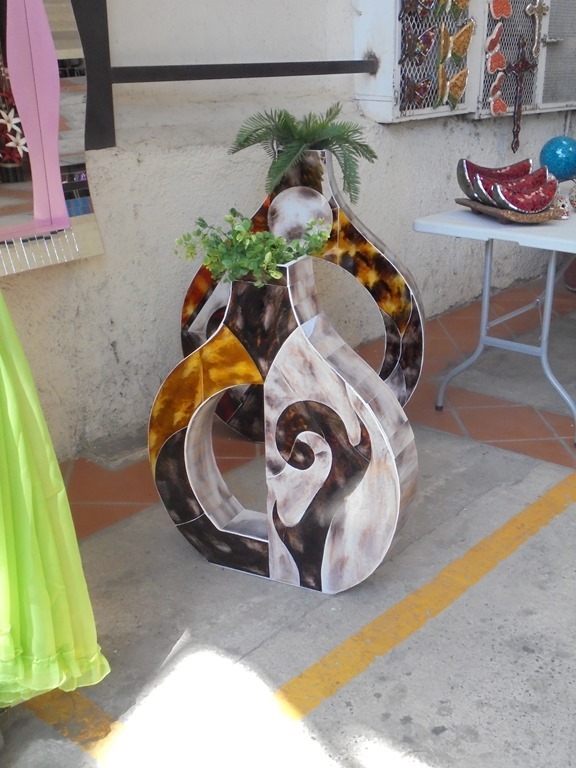 We are looking for big pots for three small trees we now have in our concrete patio area. 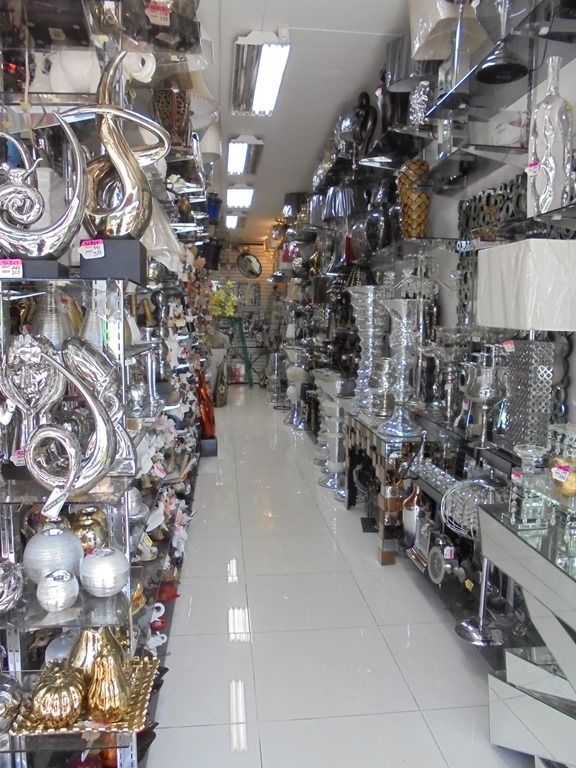 These are for decoration inside the house. Big ones like these are what we need. There is such variety of colors and designs it makes it hard to decide. 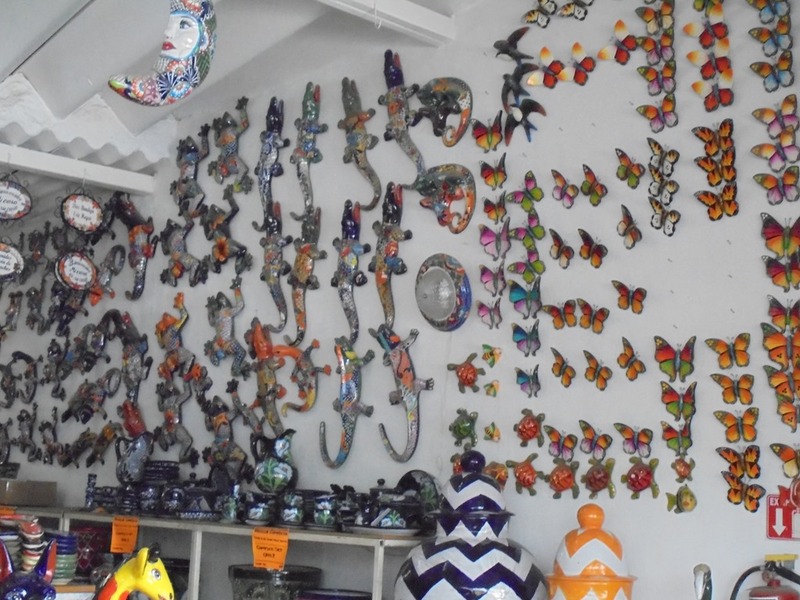 If you need lizards and such for your walls, this is the place. 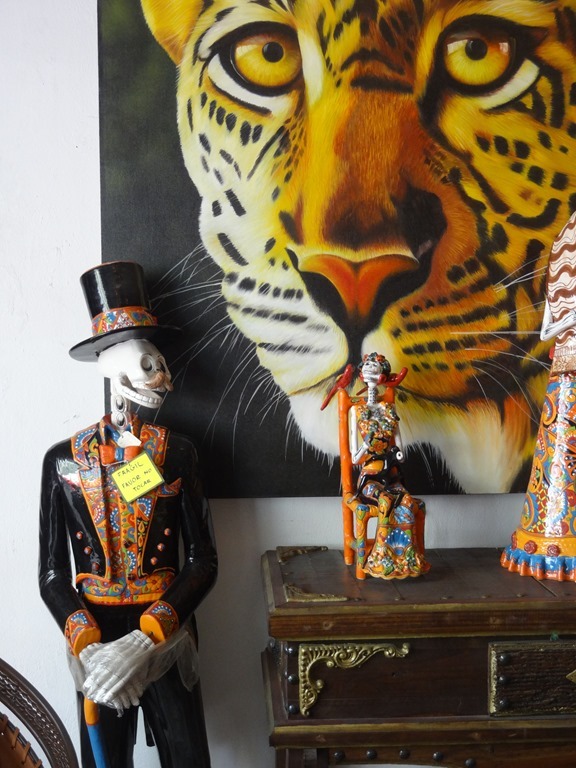 This metal figure shop features painted skeletons. 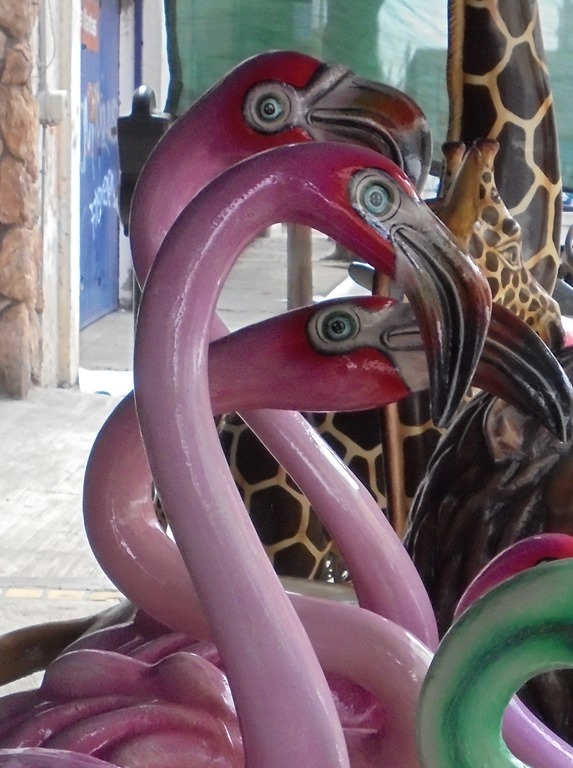 I like this large glazed bicolor face. Where would we put it? 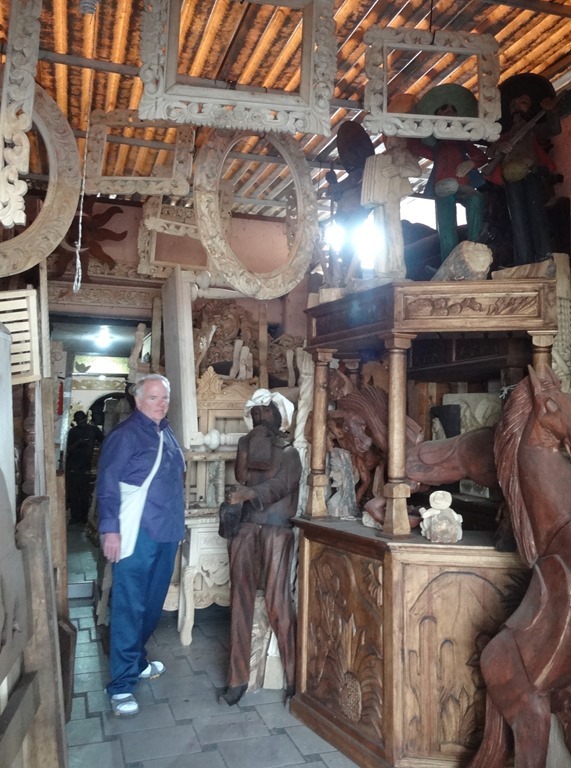 I am in a shop of wooden things, standing next to a life-sized wooden man. 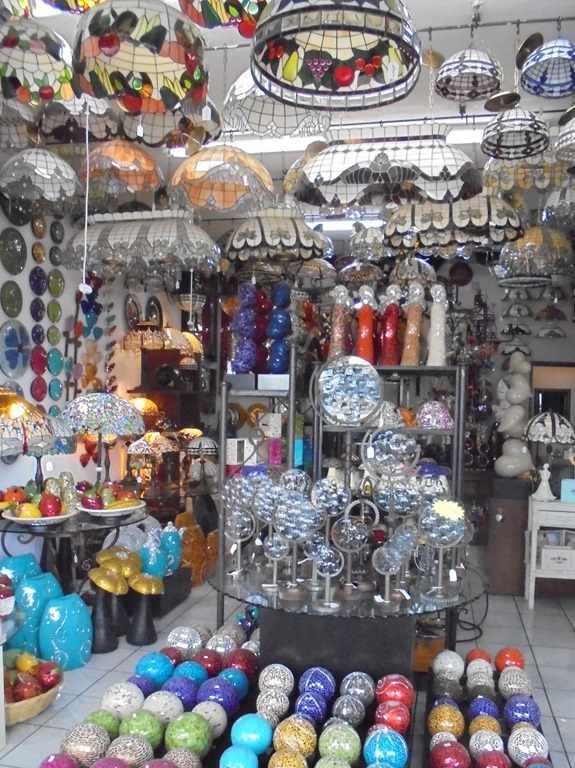 Table decorations, mainly balls of different forms, and stained glass ceiling lamps. 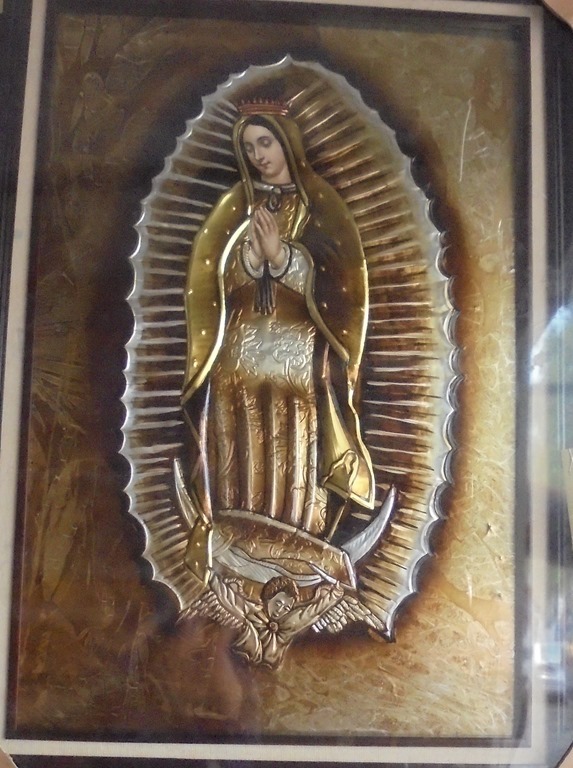 The Mother Mary, probably the most popular Christian figure here. 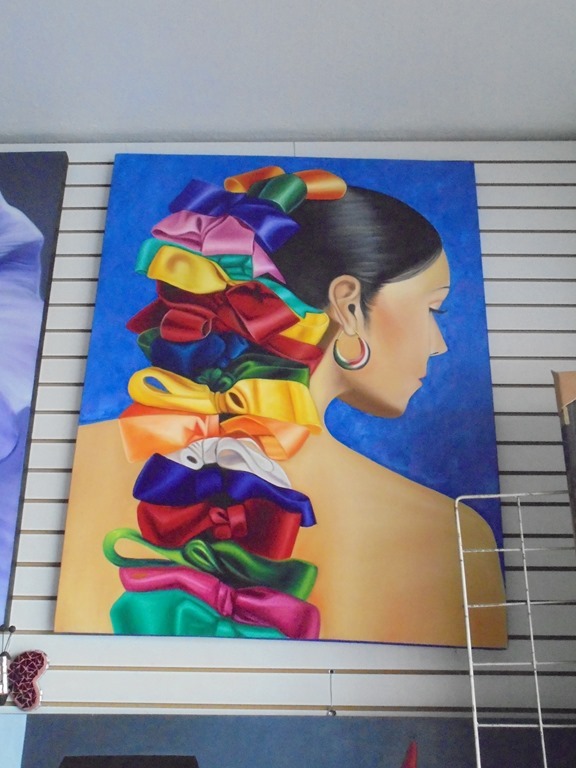 Right next to Mother Mary is this contemporary painting of a modern woman, wearing many brightly colored bows. 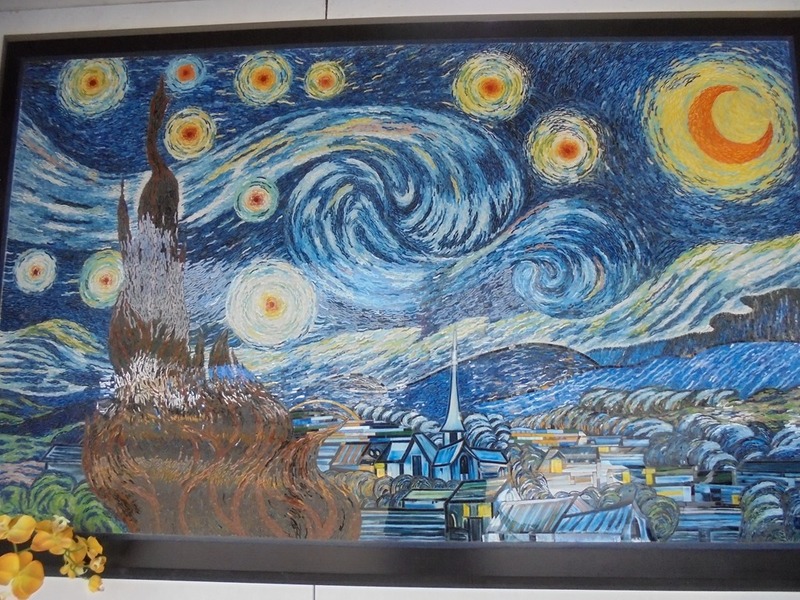 Van Gough’s Starry Starry Night, reproduced as a tile mosaic. Carol walks among the stars. 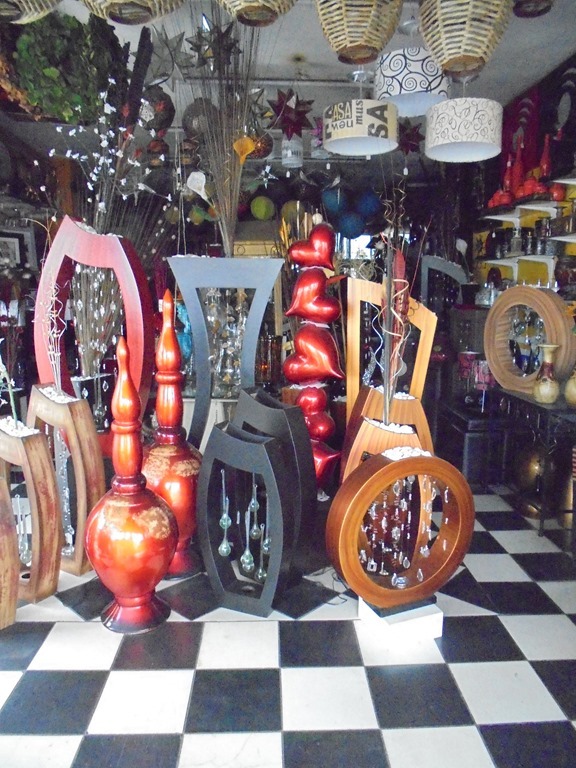 Wicker lamps, most painted silver. A glass object. 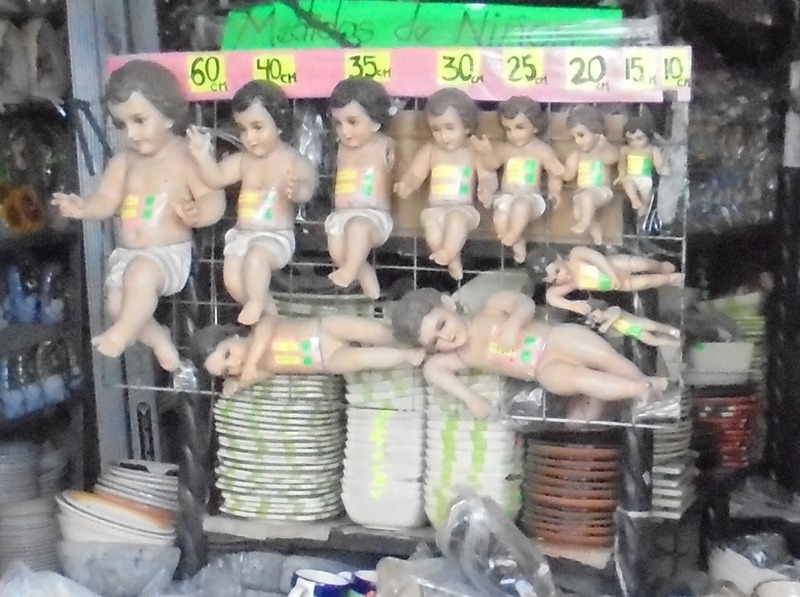 I think this is intended to hang from a ceiling. 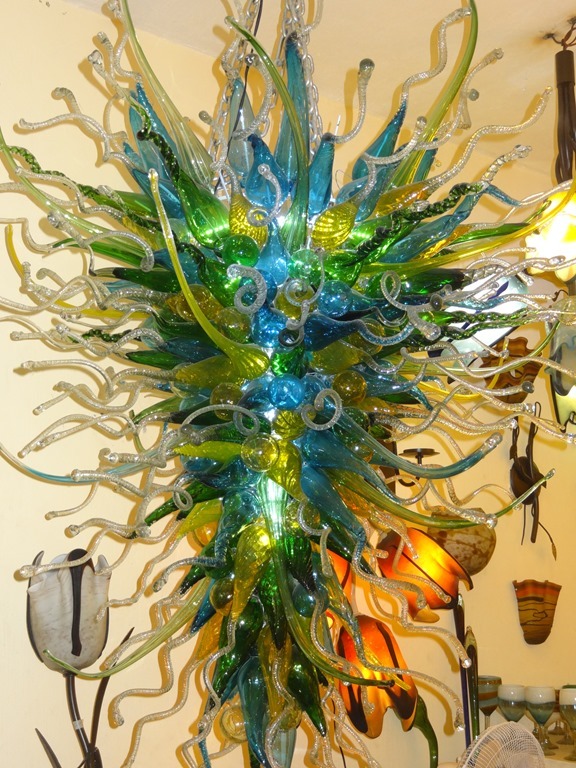 Reminds me, or rather, is a rip-off of, Dale Chihuly’s work. 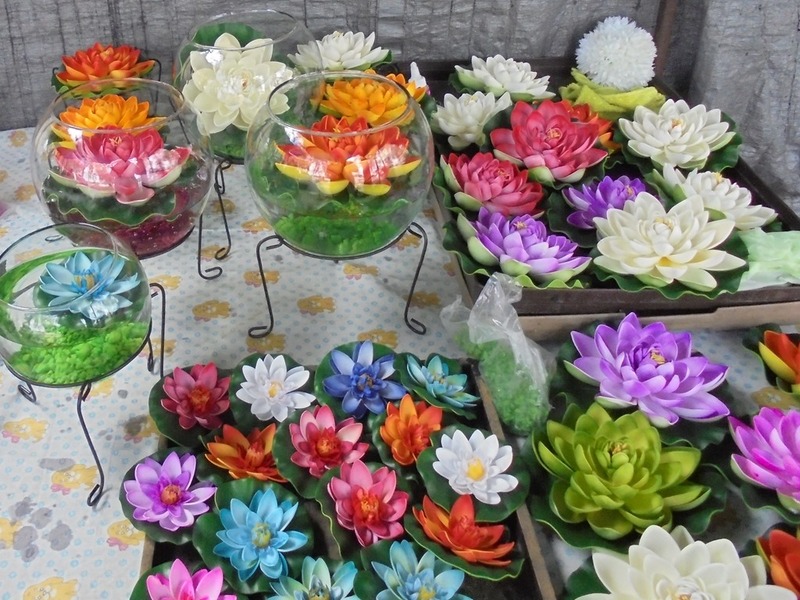 Artificial flowers to brighten your house (without the trouble and cost of real ones). 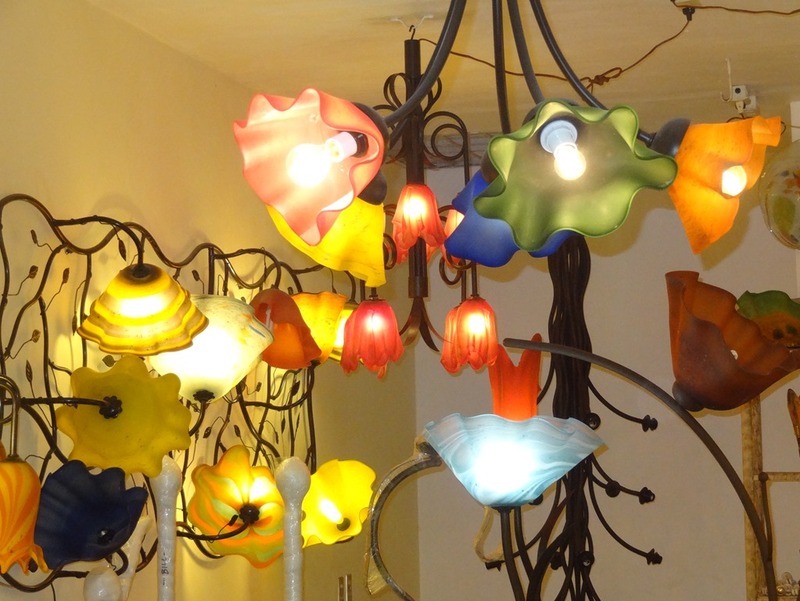 Colored glass lamps for walls and ceilings. 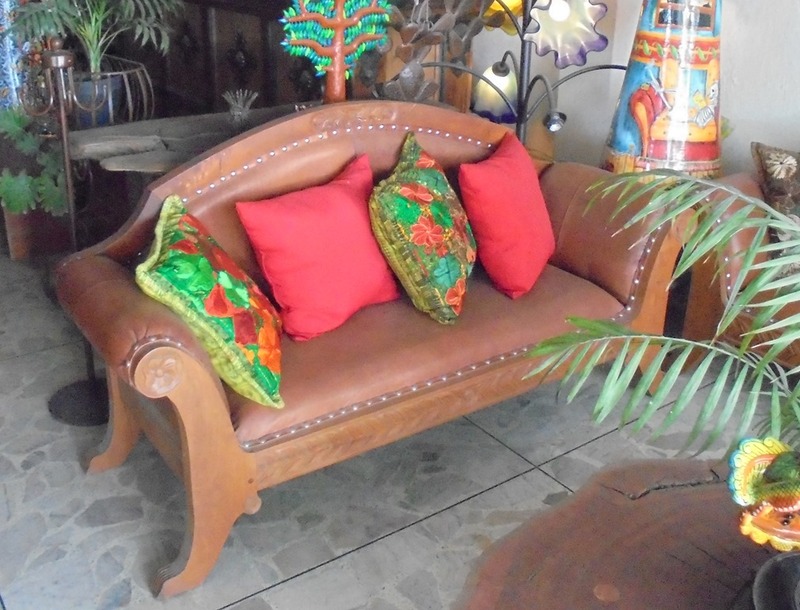 A leather couch with bright pillows. 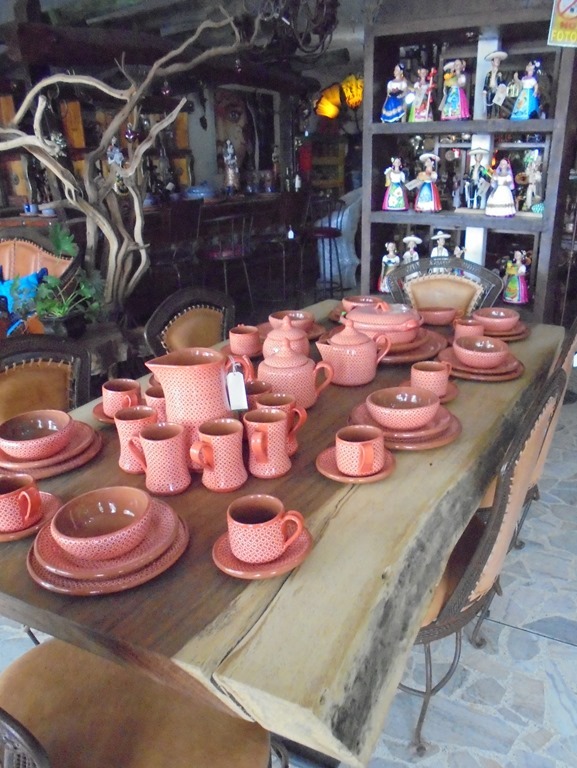 Earthenware dishes, a full set in pink. 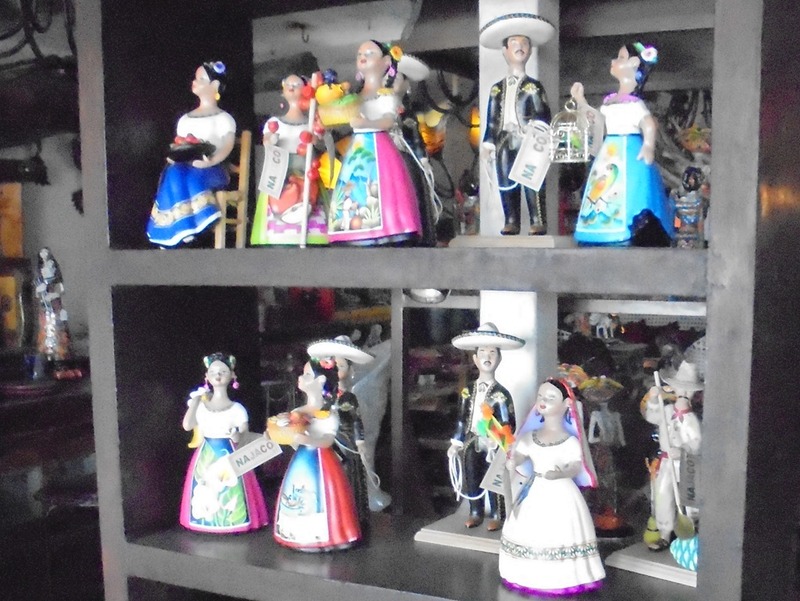 Small Mexican figurines. 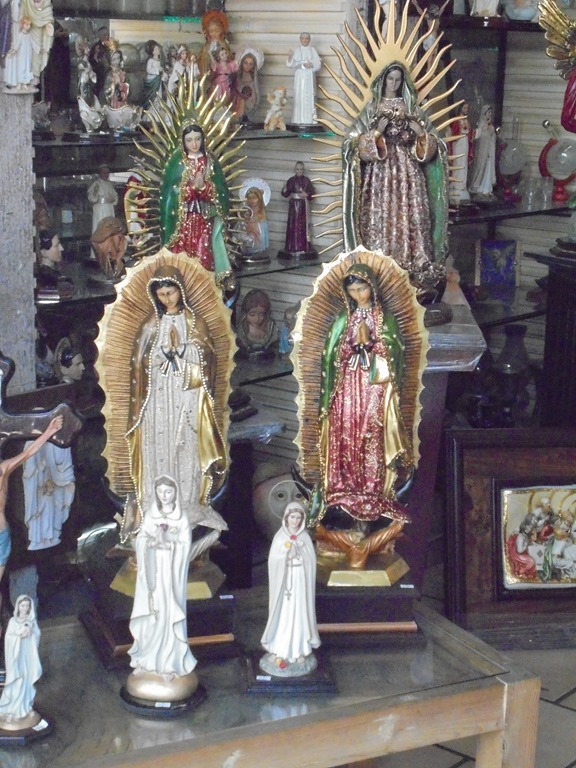 I think Mexicans still live in an idealized and romanticized past. 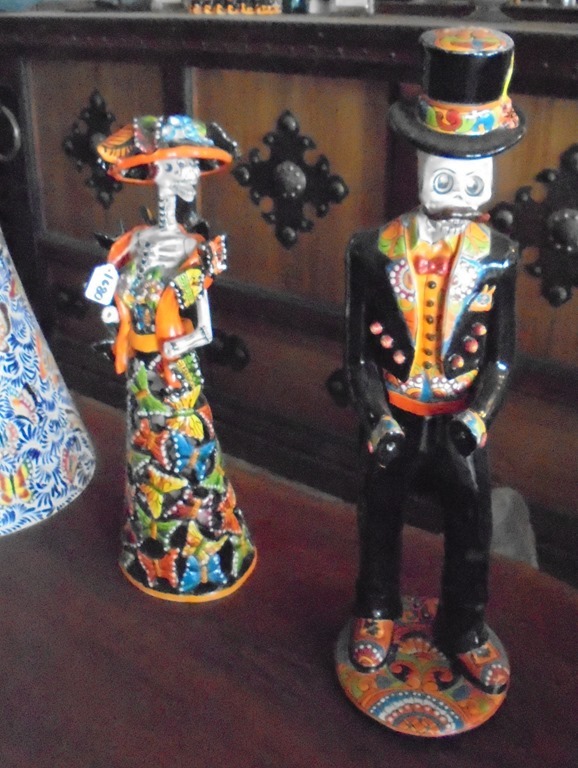 Here is a ceramic skeleton man and woman. 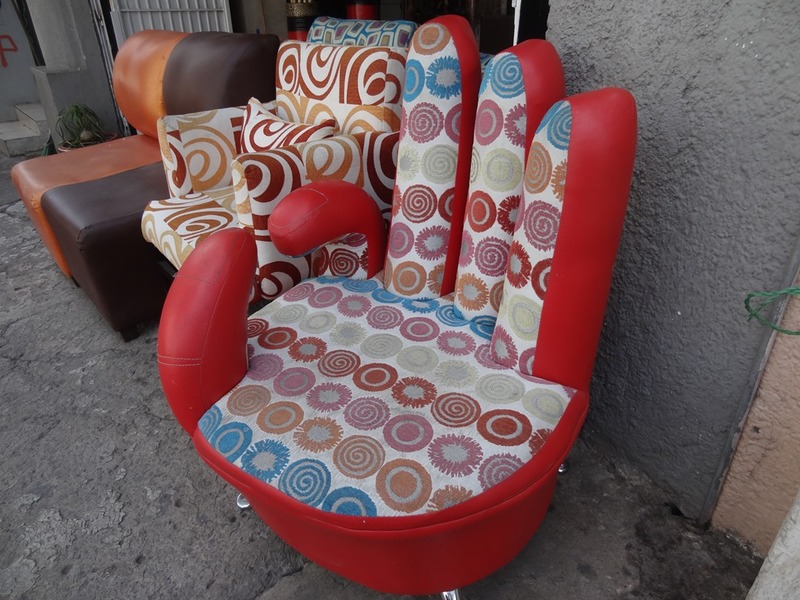 Where would you put these in your house? 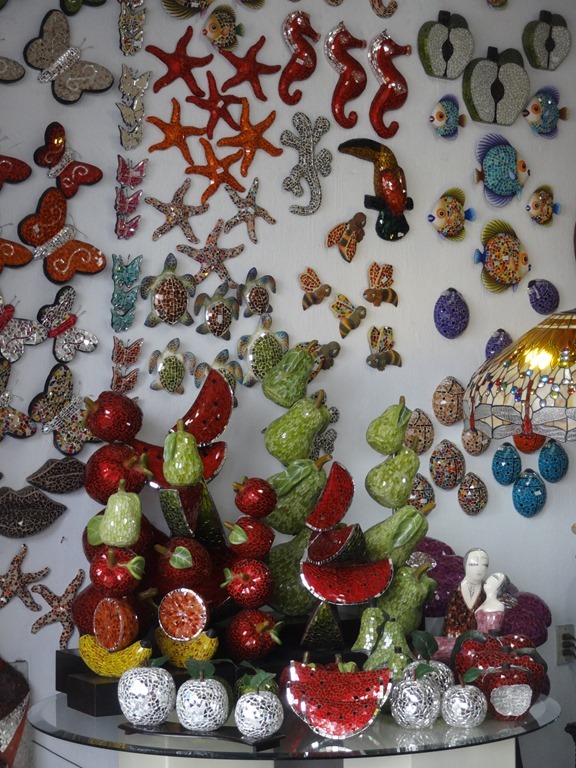 More wall decorations, above shiny mosaic-looking fruit. 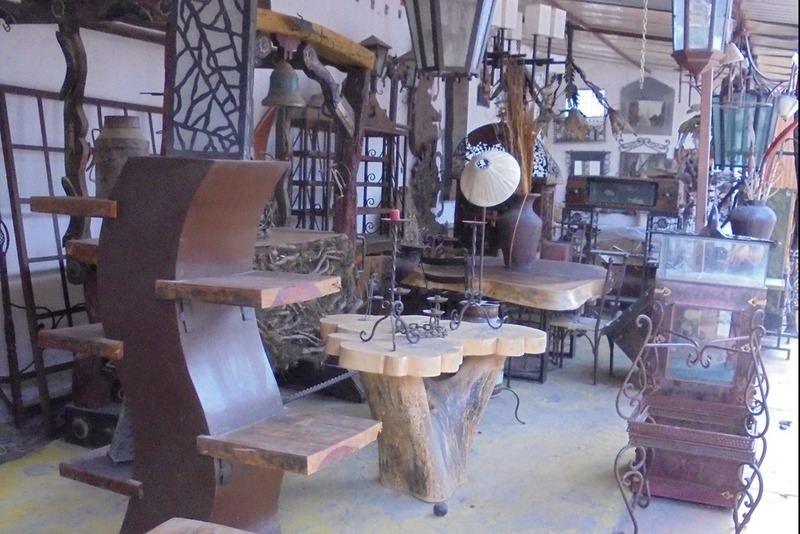 Wooden and metal things for the house, intended to decorate a space. 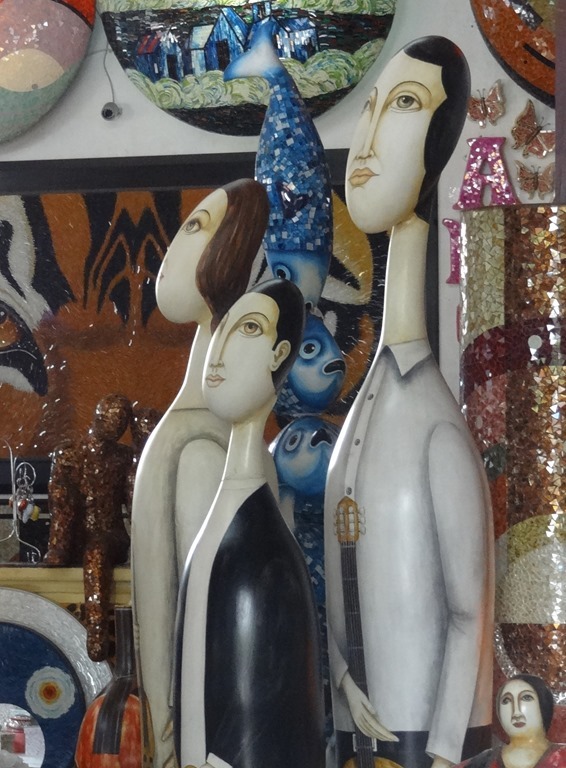 I think these are ceramic figures, but they could be wood. These are certainly not traditional. 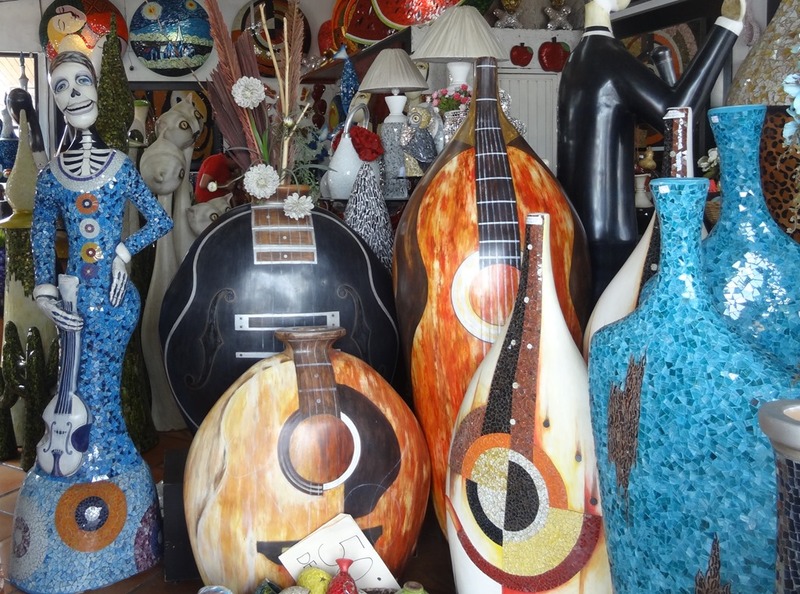 Big ceramic objects to sit on the floor in a special spot in your house. 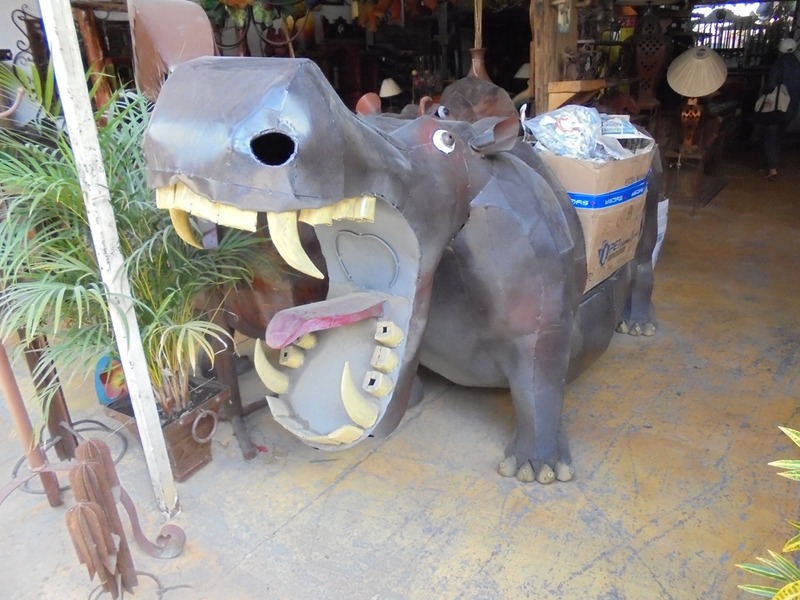 Here is a big hippo seat, just what we need! 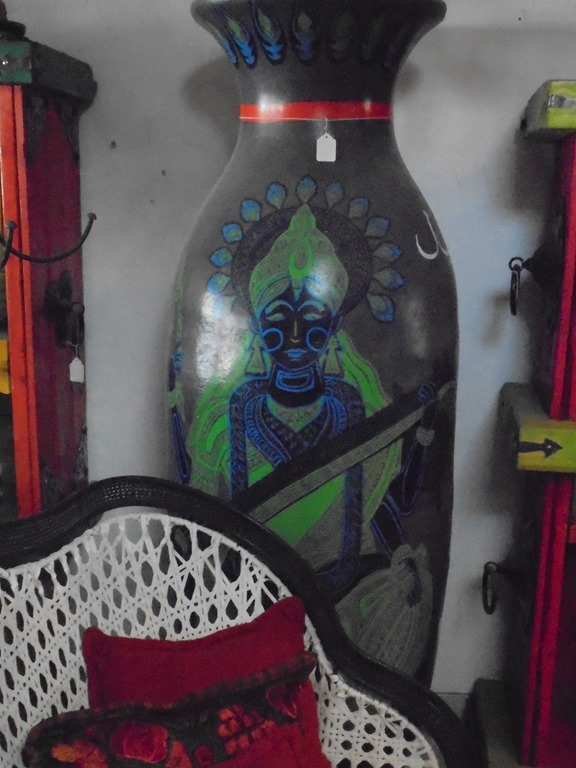 One of the few things we saw with an Indian-looking design, maybe Sarasvati with her musical instrument? 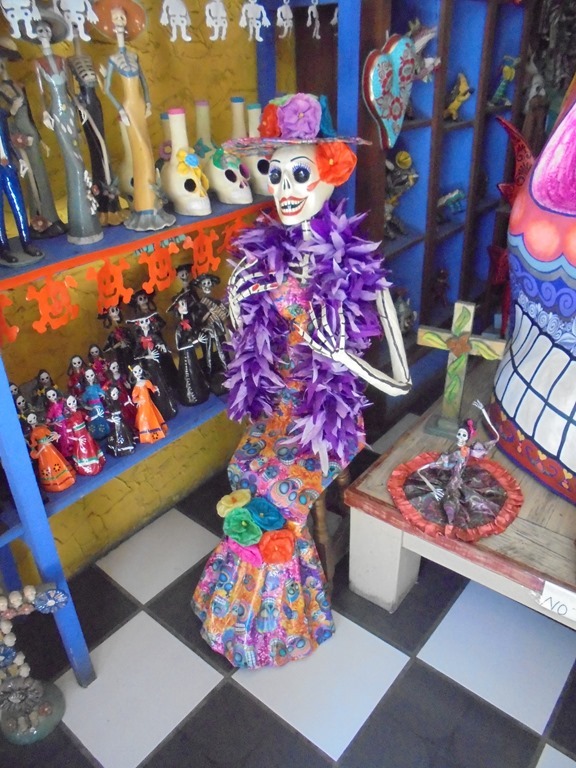 A nicely dressed skeleton woman. 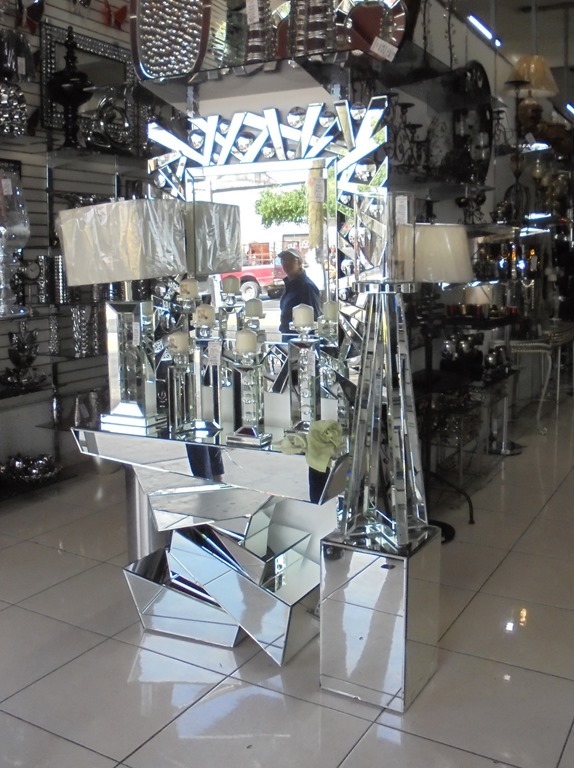 This shop is filled with reflective things for your house. 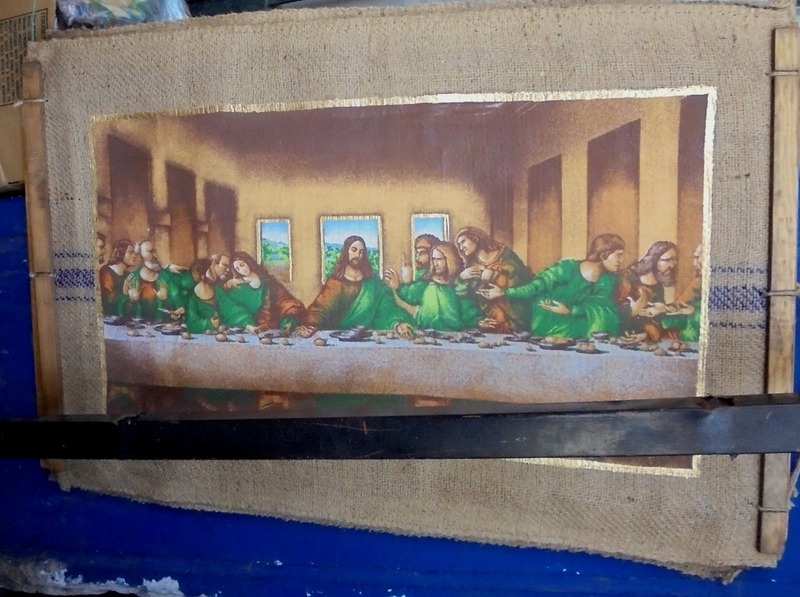 Need The Last Supper to decorate a wall? 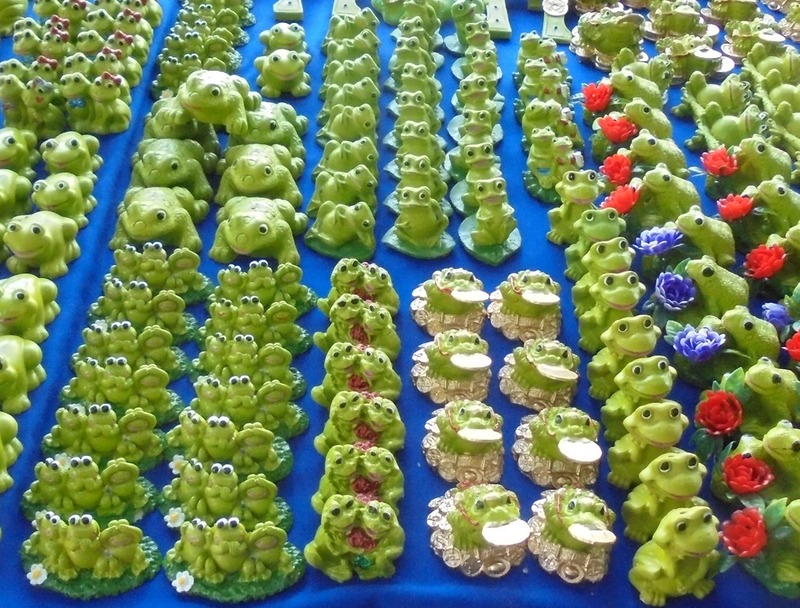 Small frogs, hundreds of them in many different designs. 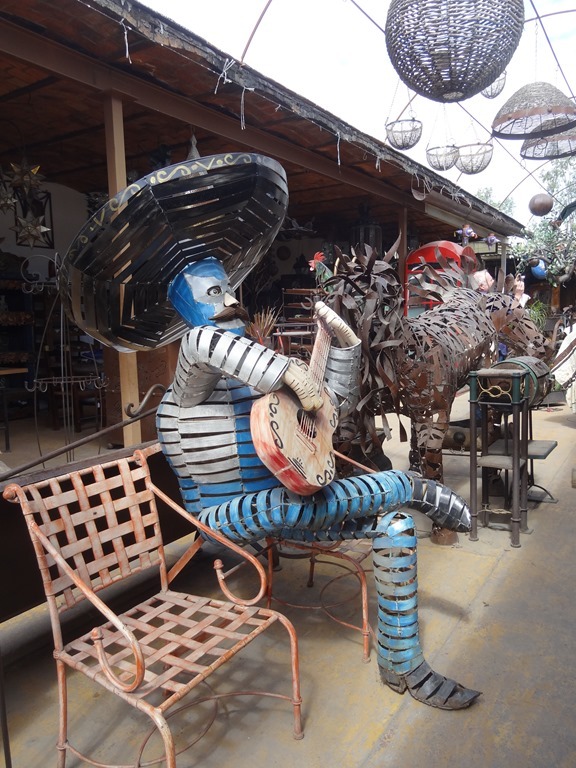 How about a life-sized metal guitar player for your patio?? 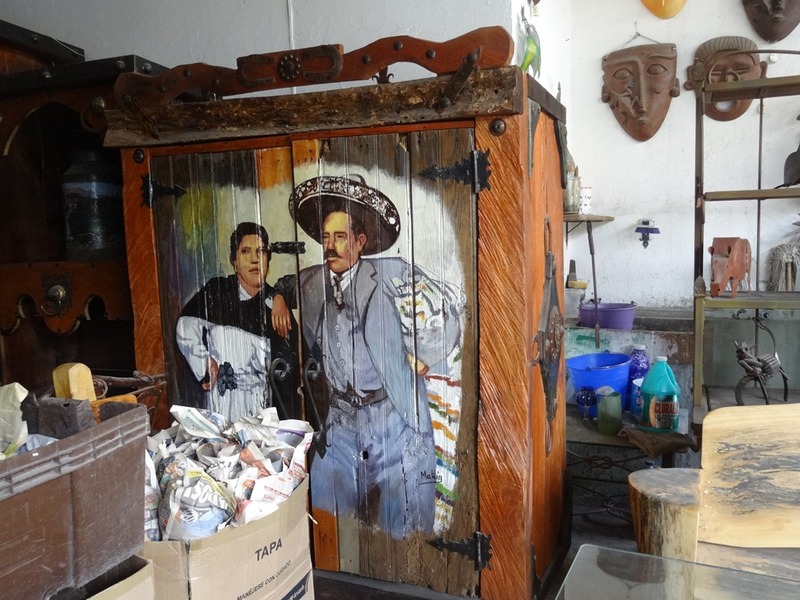 Or a wooden closet with a traditional couple painted on the doors? Oh I need this! I guess it is a stylized coyote howling at the moon. A skeleton kitty, not so much trouble to keep as a real one. 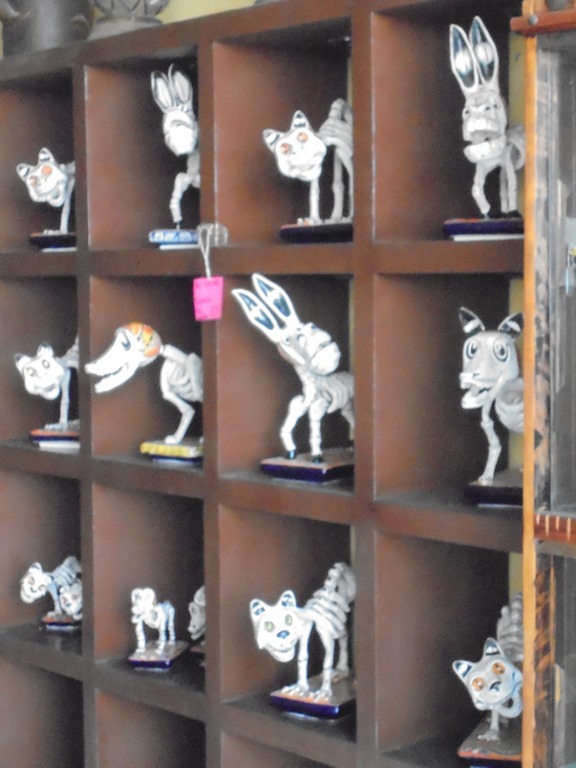 Skeleton figures. I am not sure that the leopard knows what to think about them. 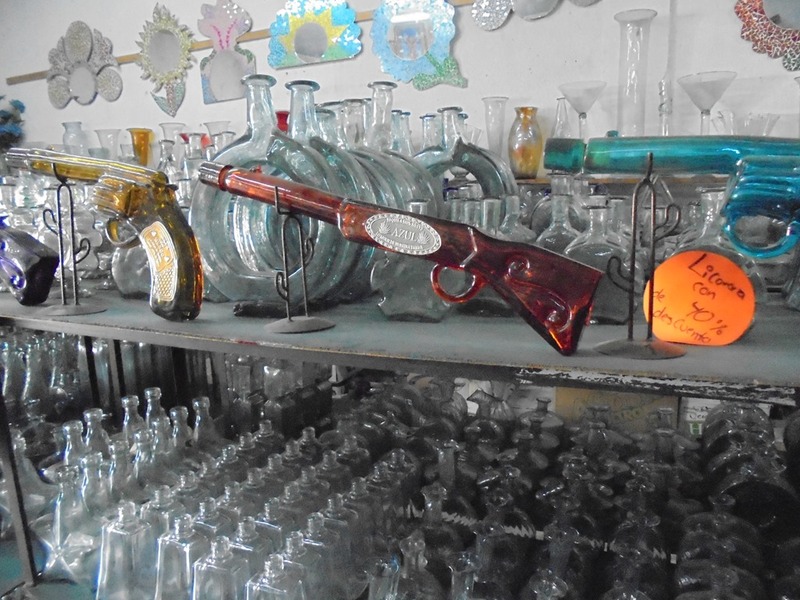 Glass rifles and pistols. 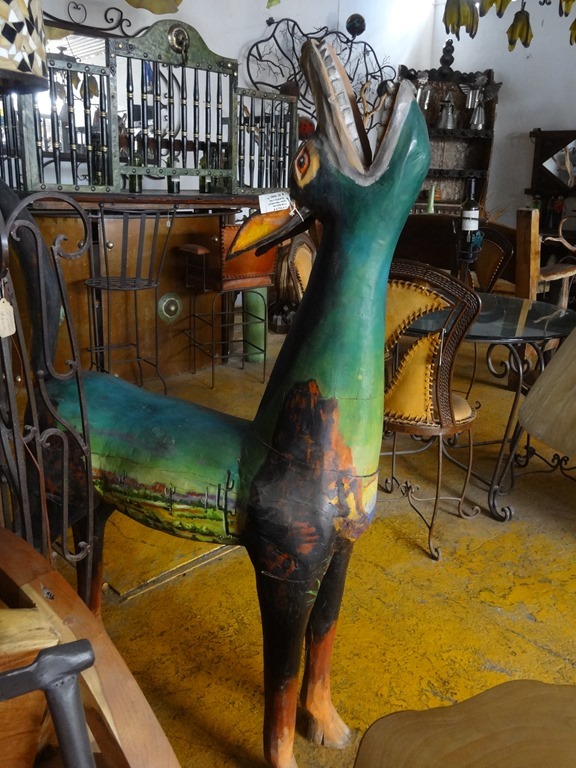 I guess these are to decorate a NRA member’s house. 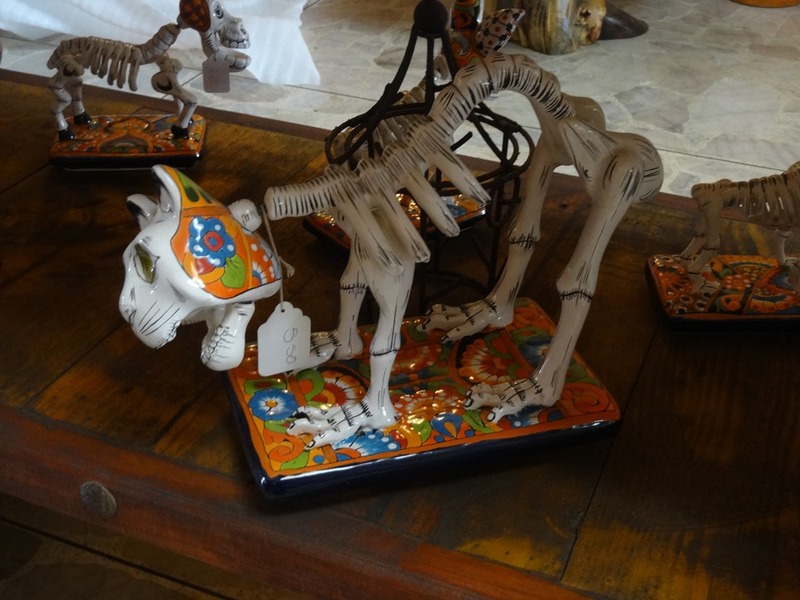 Ceramic skeleton animals, for any niche in your house. 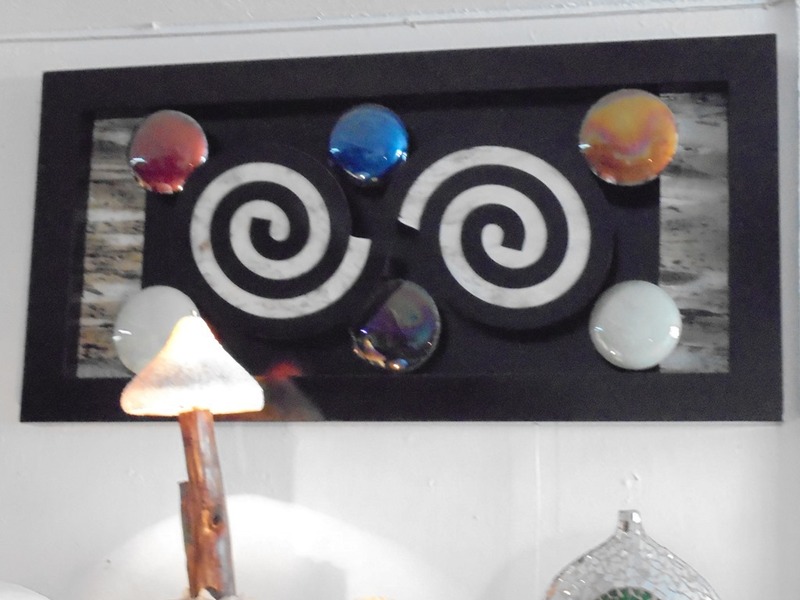 Modern arty things for the wall that needs just the right style. 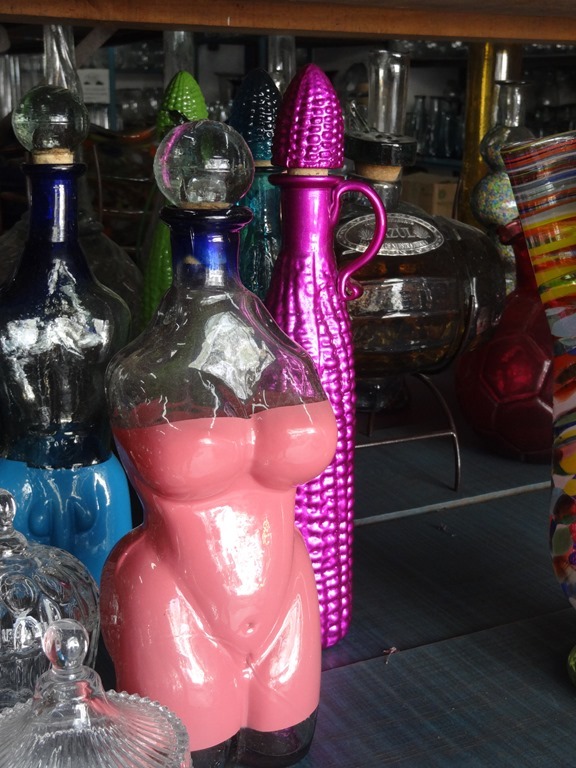 Your basic blown glass bottle in the shape of a woman’s body. This certainly is not our style. This is great, a giant hand in the shape of a Buddhist mudra, made into a chair, so you can sit in peace guess. 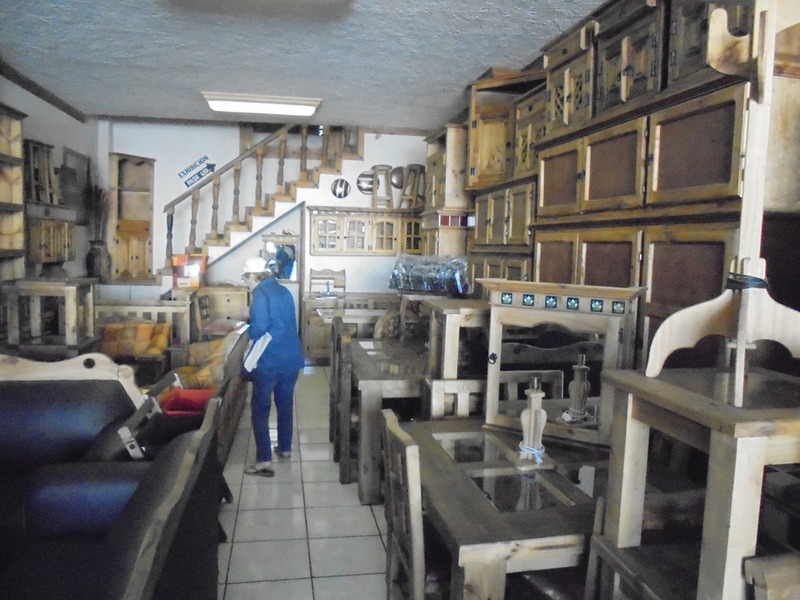 Carol in the midst of wooden furniture. 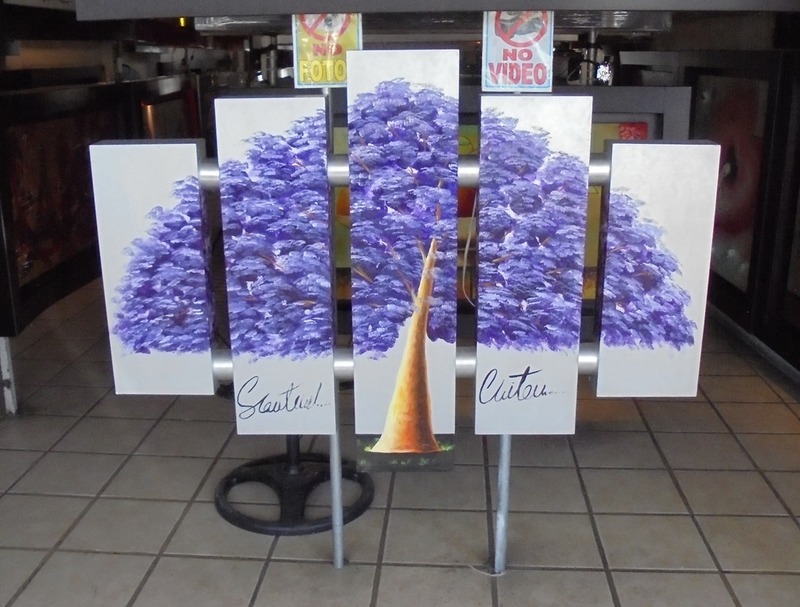 Colored things to put in your tall pot for decorating your house. 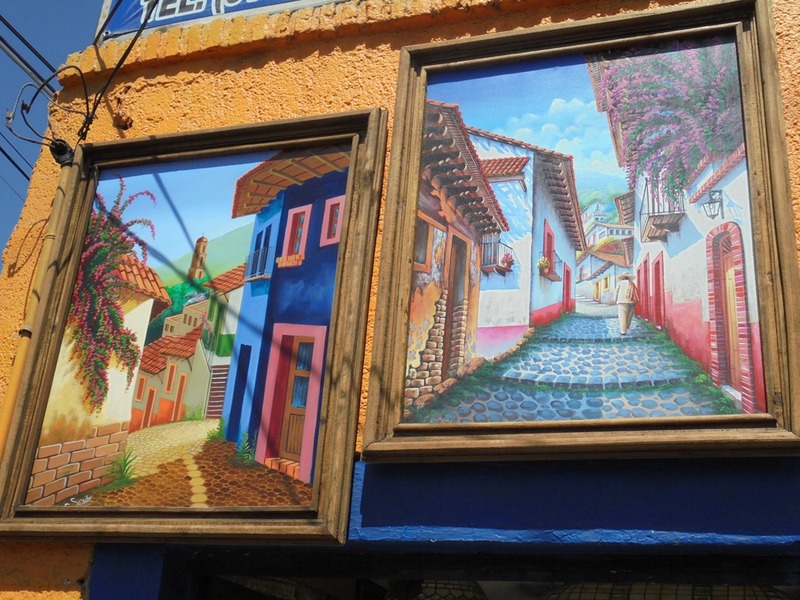 Paintings for your walls. 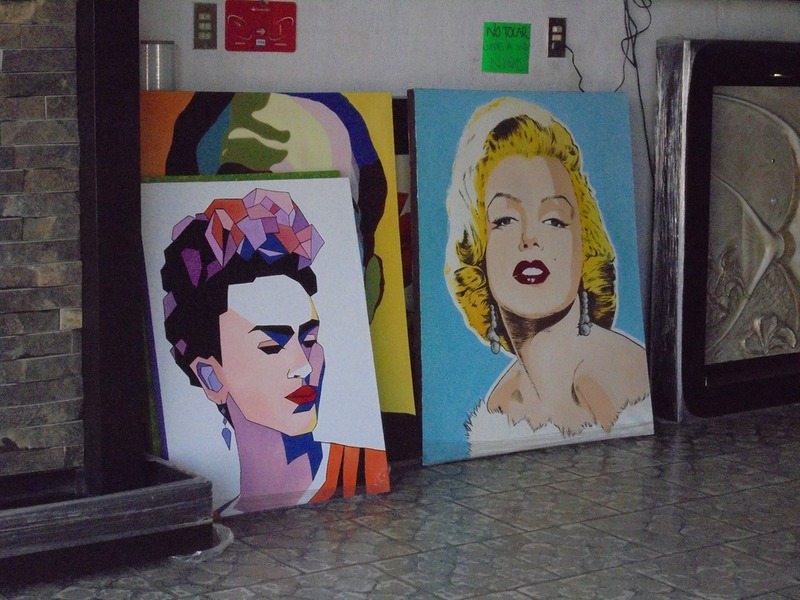 I like the juxtaposition of Freida Kahloh and Marilyn Monroe. No shame here in copying Andy Warhol. 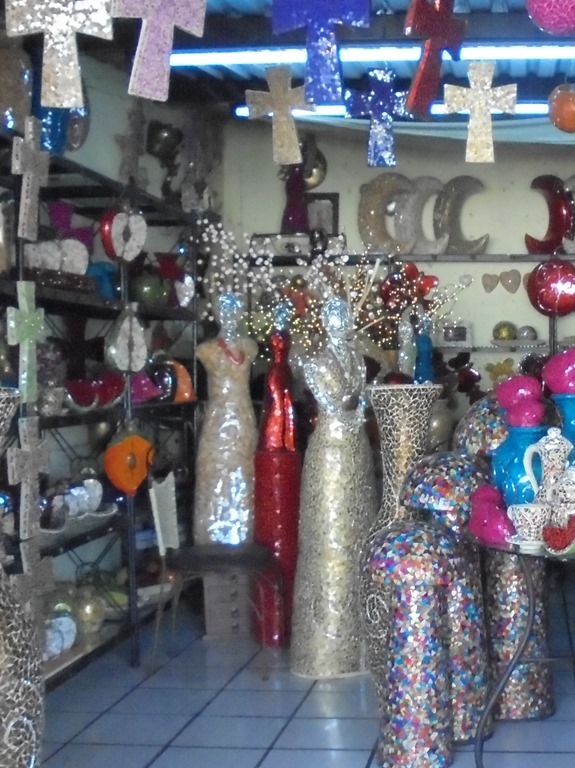 Shiny crosses and other ceramics. 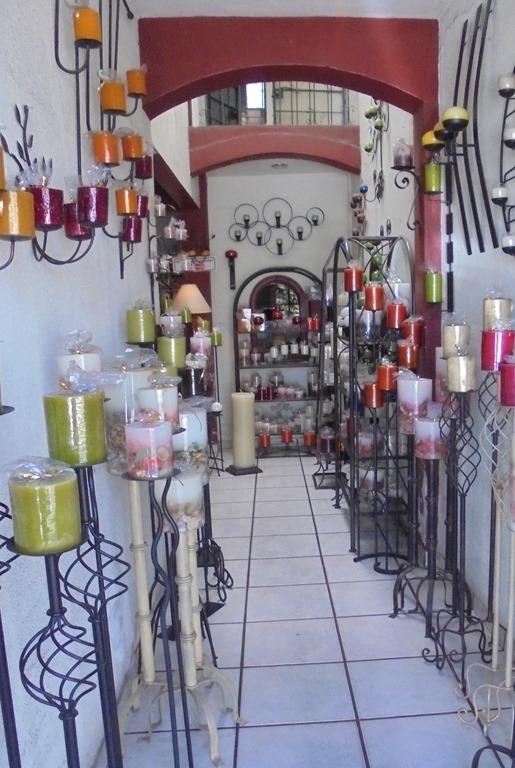 Tall candles in a narrow shop. 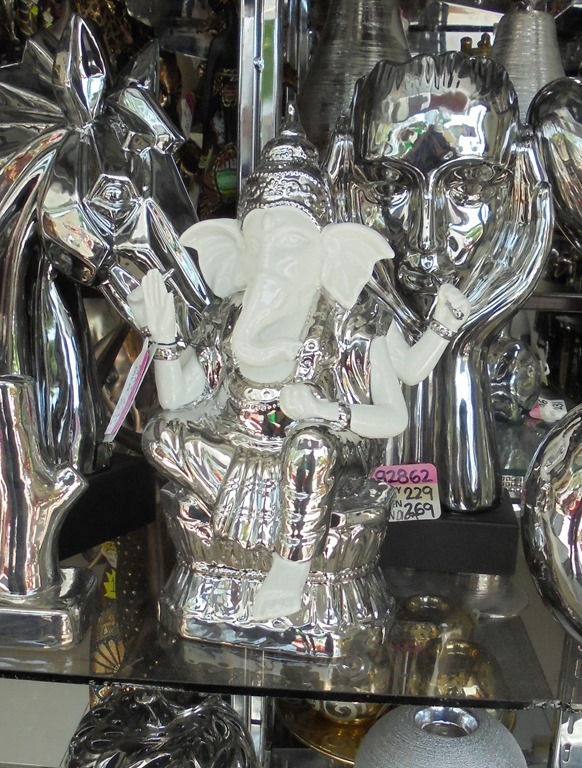 Including this Ganesh. He was hard to make out in the midst of the reflections. 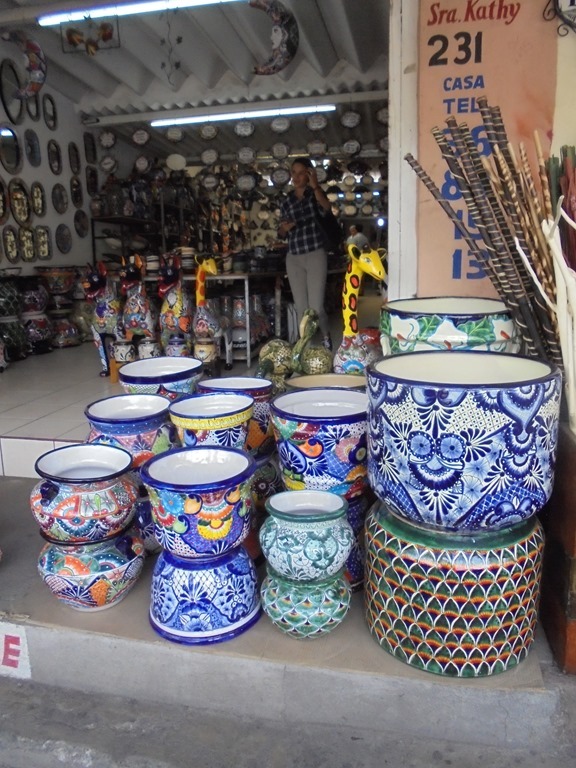 Big modern pots for the right place in your house or garden. 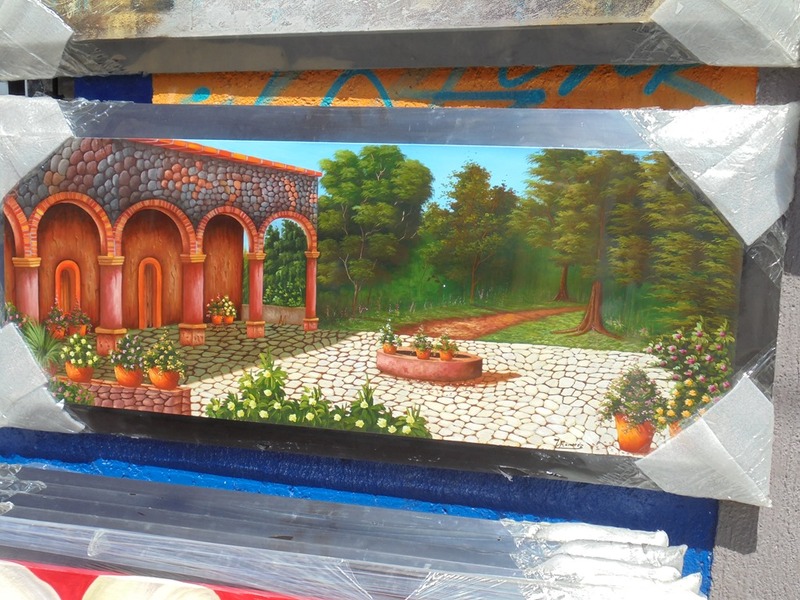 A romantic old-style Mexican scene. Frieda Kahlohs for every place in your house. 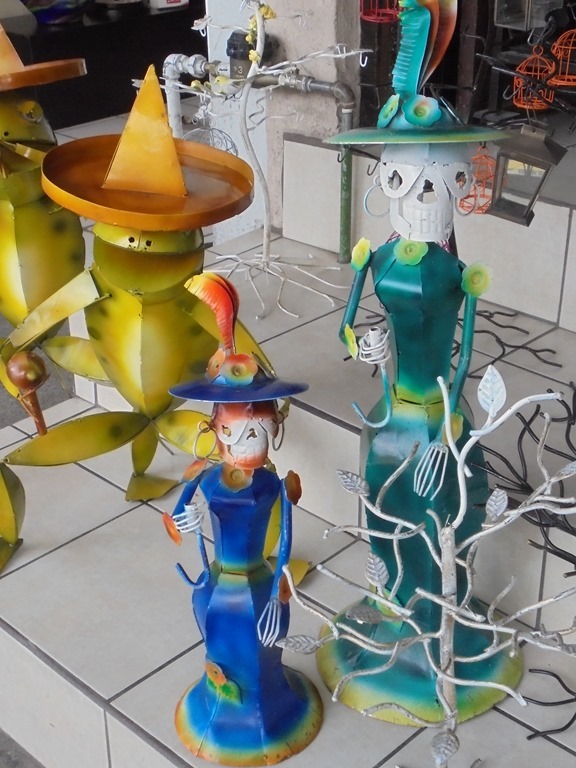 I had not realized that she is such a popular character in Mexico. 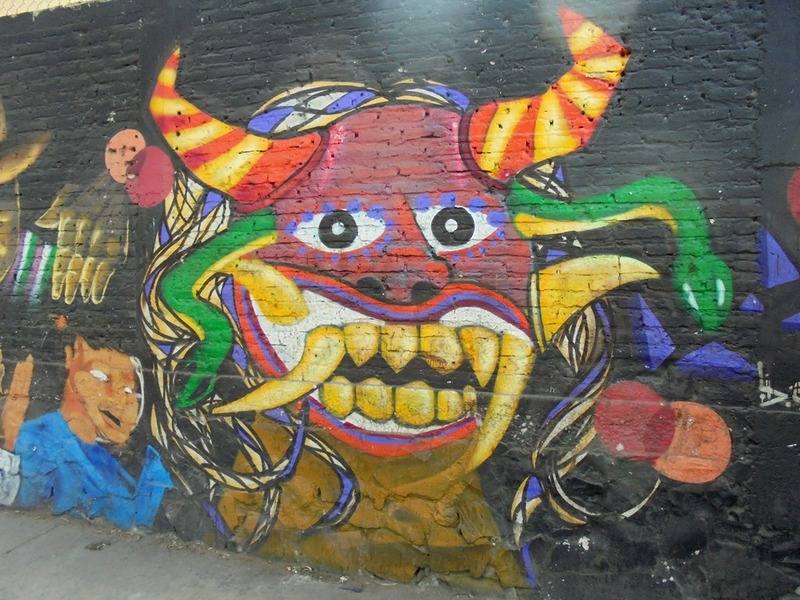 Now for more contemporary wall paintings. Here is a tree, in five sections and false colors. 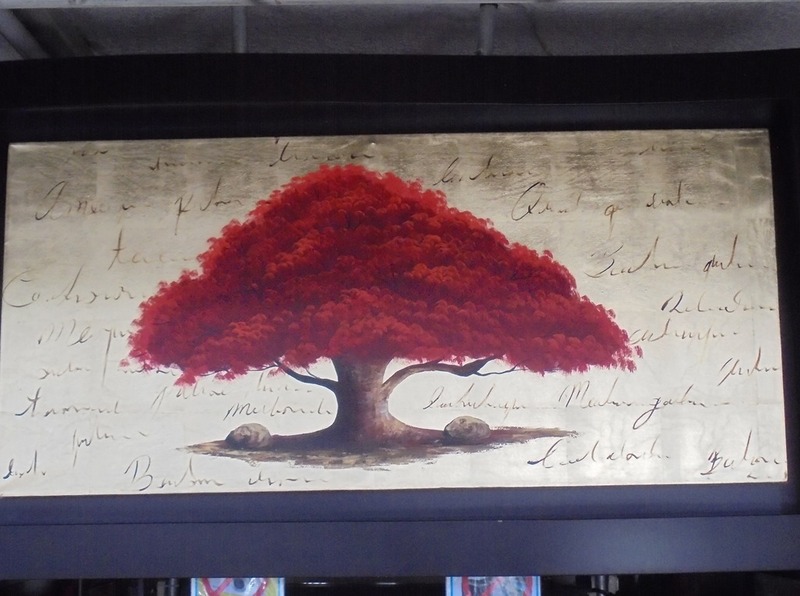 Or a reed tree on a gold background with writing on it. 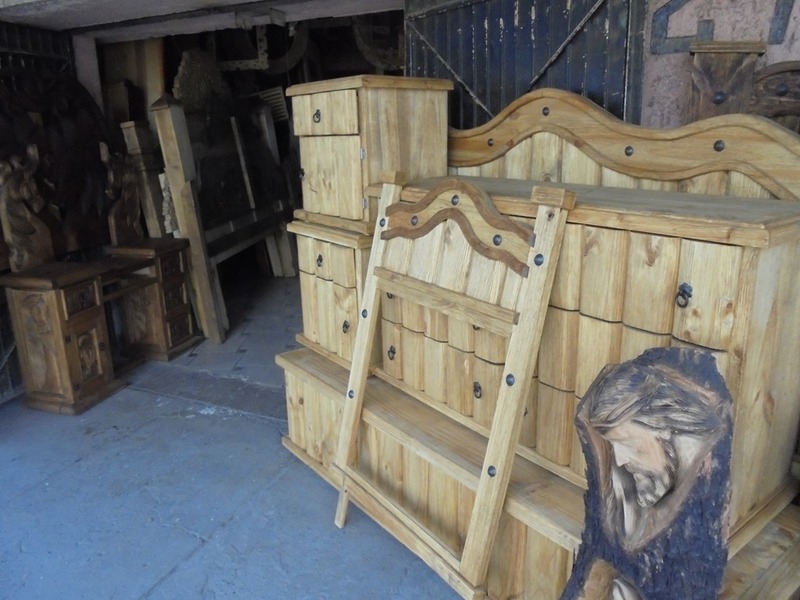 More wooden furniture. We are about exhausted by looking at all the tacky decoration at this point. 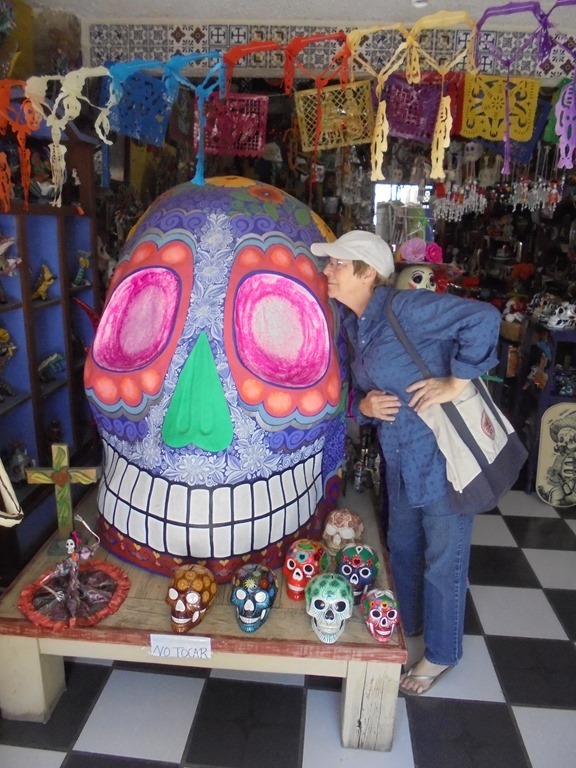 Carol is cheek to cheek with this oversized skeleton head. Again I wonder where would you put this in your house? 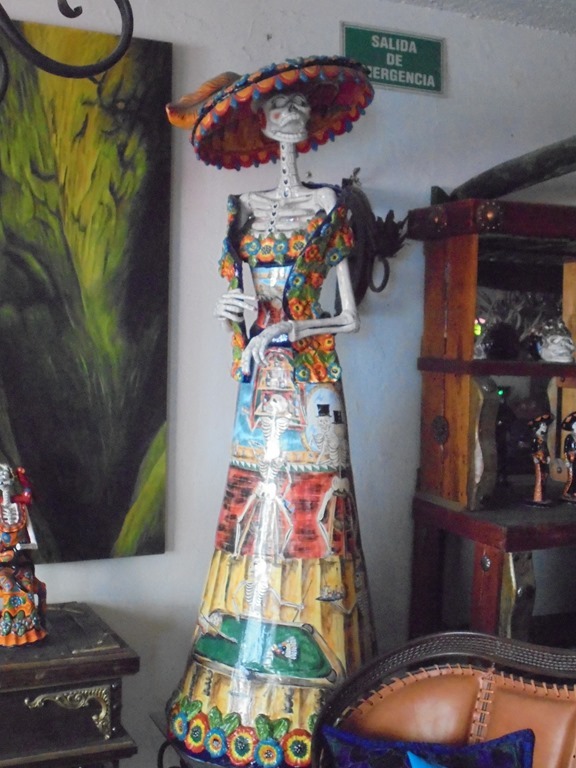 I guess you could have these fancy-dressed skeletons at one of your parties. 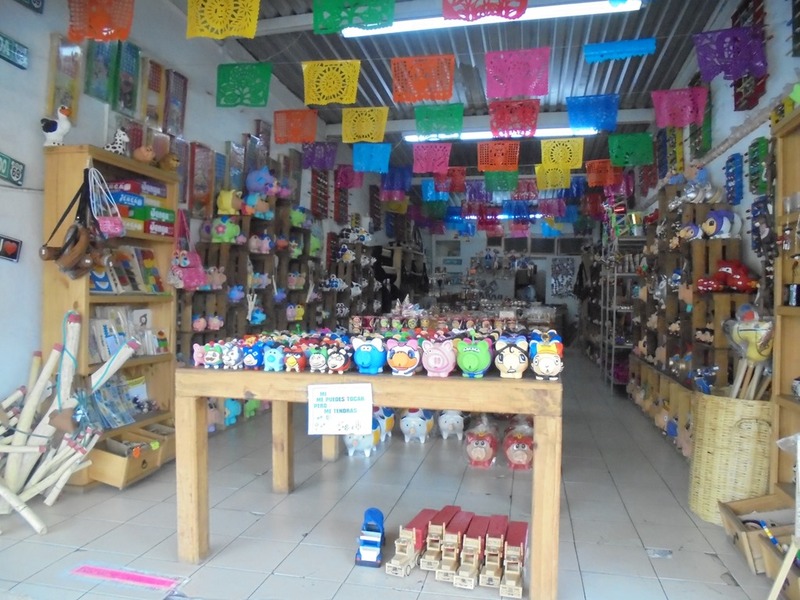 After all our expectation, we bought very little in Tonala. Little here had any sense of style that was compatible with ours. 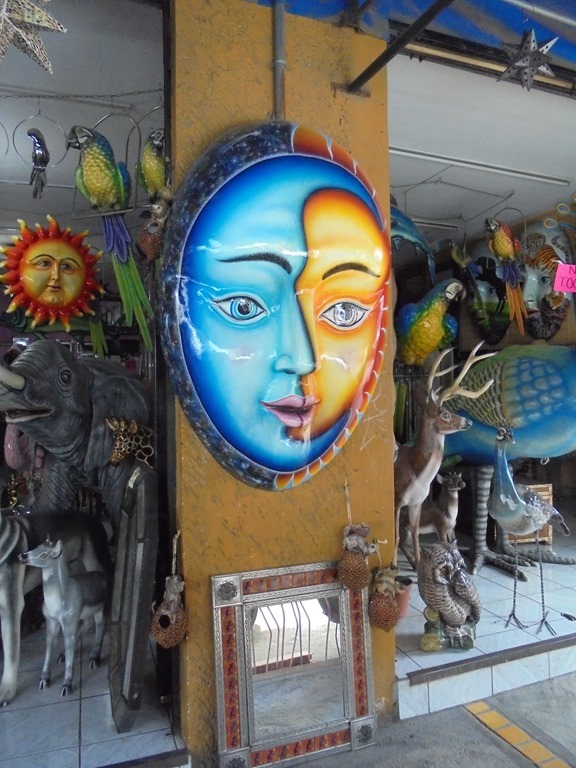 This entry was posted on May 10, 2015 at 11:30 am and is filed under Guadalajara. You can follow any responses to this entry through the RSS 2.0 feed. You can leave a response, or trackback from your own site. It’s all so very lovely. 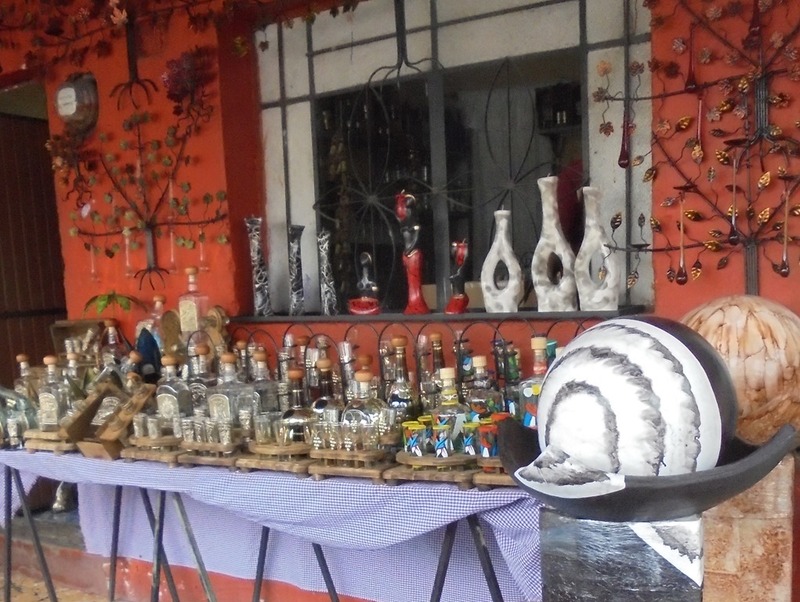 I so miss Mexico. 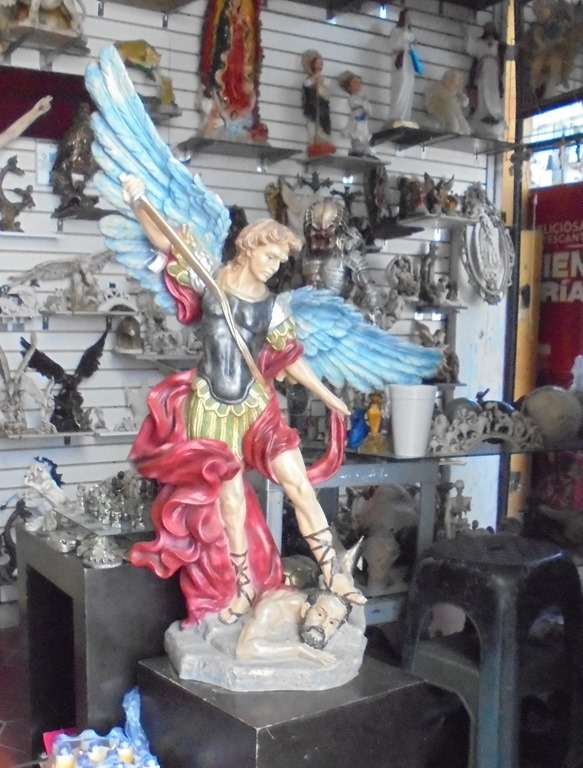 The angel is the Arch Angel Saint Michael defeating Lucifer. I would love to have it.